If you've ended up here and this isn't what you were expecting, I've probably unpublished the post you were looking for. 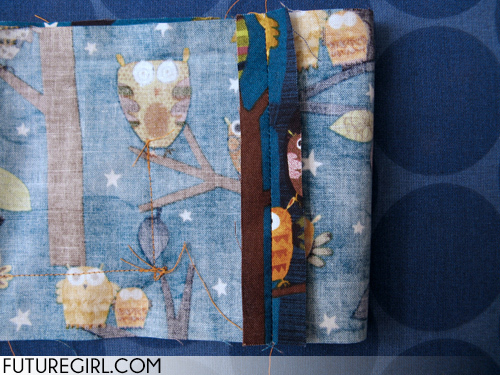 I stopped posting here around the end of 2014 after 9 years of craft-blogging. Since then, I've unpublished most of the posts (900+), leaving the ones people still find useful (~50). Sorry if what you were looking for is gone! 3. This side does not have a spike. This is the strap side. 4. 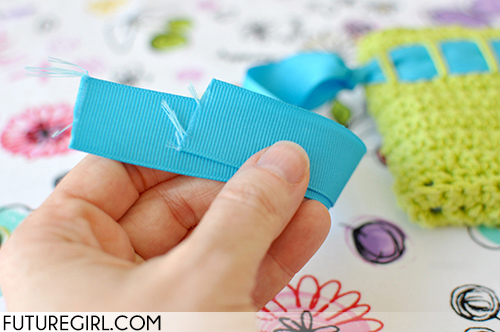 Fold your ribbon end so you can easily thread it through the first spike stitch. 6. ... until you've gone all the way around. 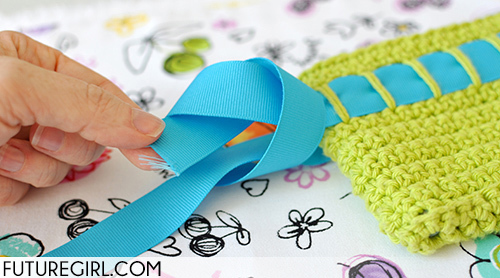 Adjust the ribbon so both loose ends are the same length. 7. 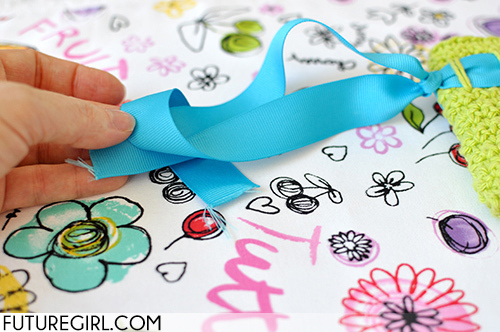 Take one ribbon end and wrap it around the other ribbon end. 8. 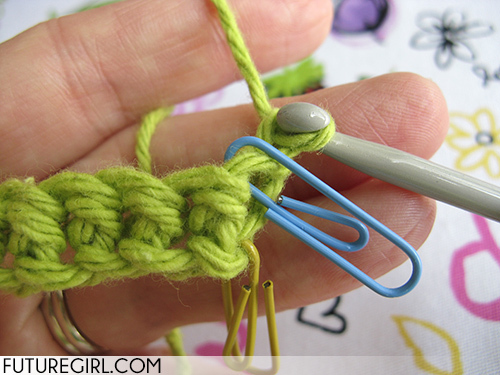 Make a simple knot. 9. 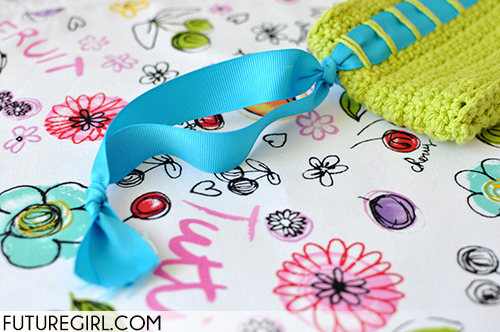 Pull the knot tightly against the wristlet. 10. Here is what the strap looks like with the first knot completed. 11. The other strap is now longer than the knotted strap. 12. 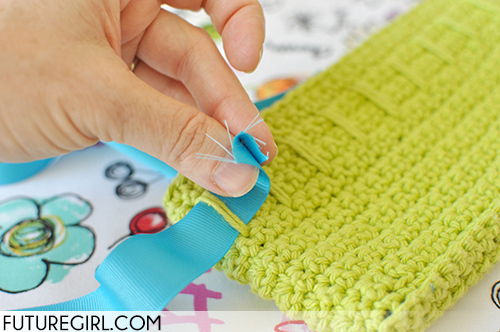 Take the longer strap and wrap it around the shorter strap. 13. 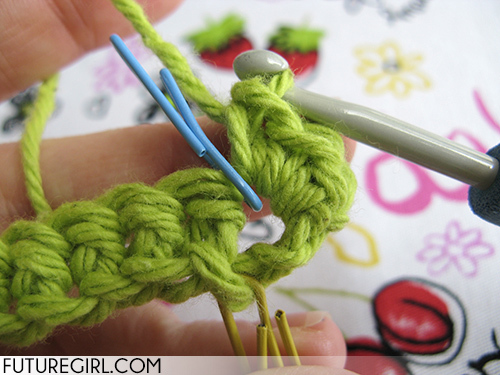 Make a simple knot near the end. 14. Pull the knot tightly. 15. 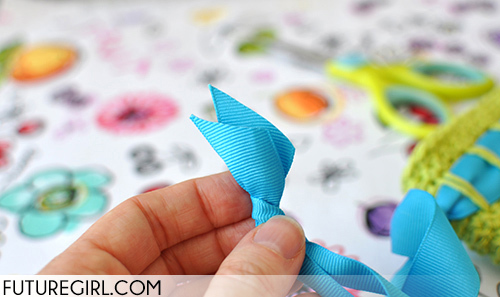 We are going to finish the ribbon ends now. 16. 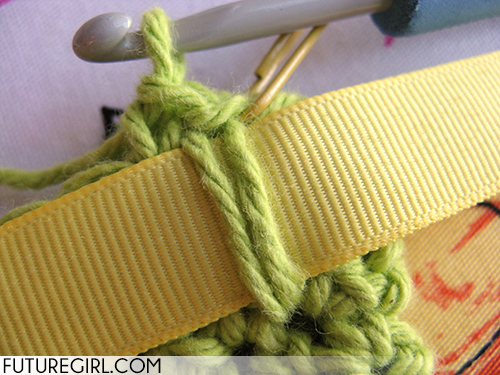 Trim both ends on a diagonal. I trim them separately, not at the same time. 17. Here they are trimmed. 18. 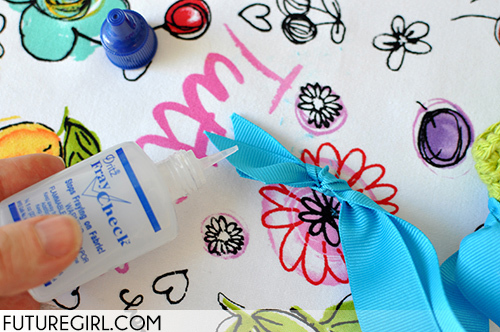 I use Fray Check™ to secure the threads at the end of the ribbon so they don't fray and look a mess. 19. The strap is done. 20. 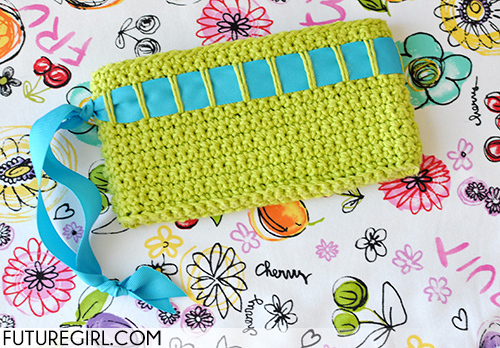 Now you can use your wristlet. 3. 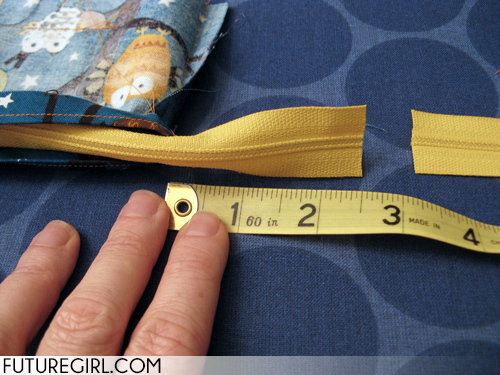 Measure the inside height from the middle of the bottom of the wristlet to to row where you will sew in the lining. In this photo, my interior wristlet height is 4". 4. 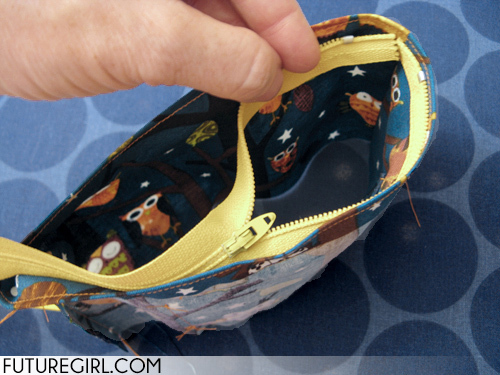 NOTE: If you modified your wristlet to have depth by adding bottom rows, you will still measure your wristlet as described. 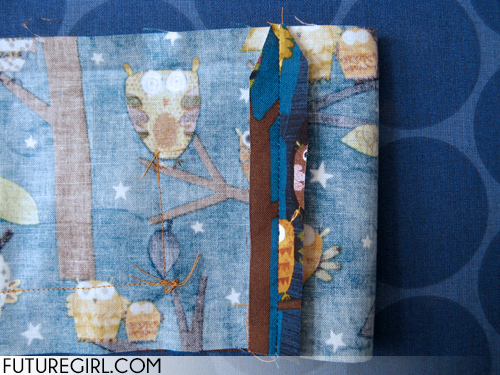 The change you will make to accommodate the depth is to square off the bottom corners to remove the extra fabric at each side. I'll remind you below. - - 2 pieces that are [width + 1"] by [height + 1"]. My pieces are 8.5" by 5". 6. 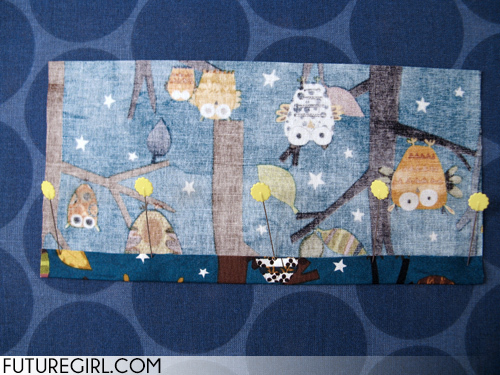 Place the pocket fabric face down on your ironing board. The 5.25" edges are the top and bottom. The 4.5" edges are the right and left sides. 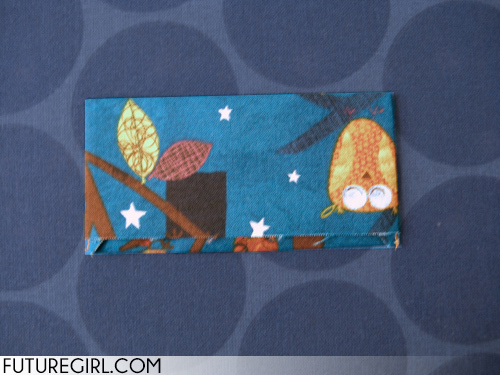 Fold up 1/2" from the bottom edge, right sides together. Iron along the fold. 7. 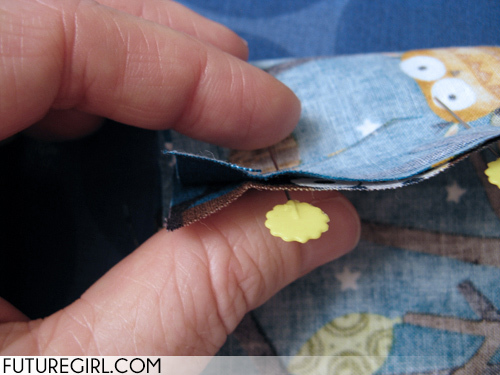 Fold the top edge down so that the folded bottom edge is about 1/4" longer than the top edge. Pin the sides. 8. 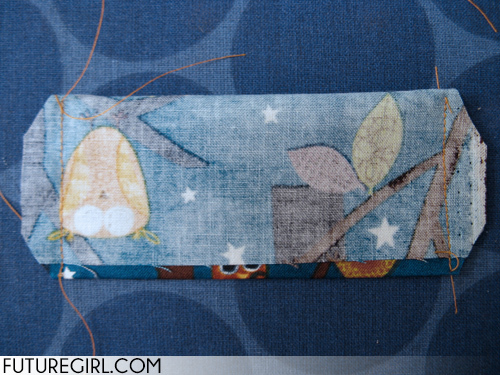 Sew a 1/2" seam on the right and left sides starting from the fold and going toward the open edge. 9. 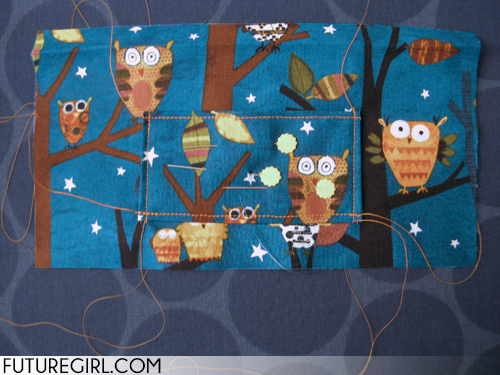 Trim off the corners of the seam allowance. This will reduce bulk when you turn this inside-out. 10. Turn the pocket inside-out. 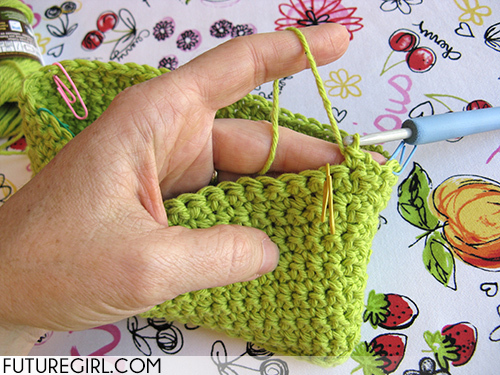 Use a crochet hook or knitting needle to push out the corners. Iron flat. This is the front side. 11. This is the back side. 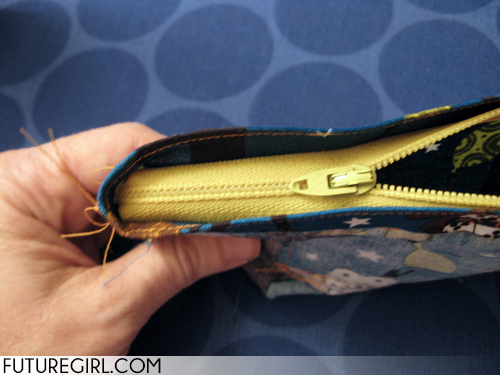 The opening is the bottom edge of the pocket. 12. 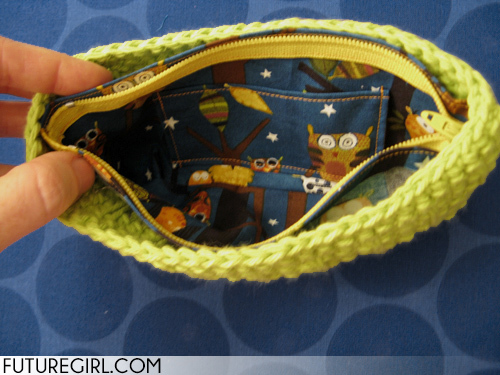 Sew across the top of the pocket 1/4" below the top edge. 13. 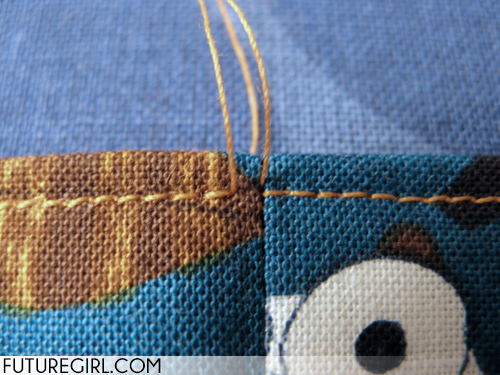 Hide the thread ends on the inside of the pocket. 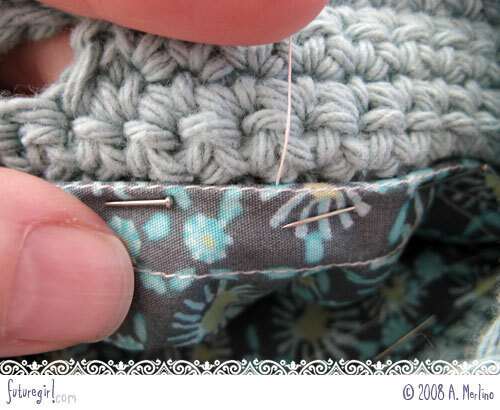 See steps 19-22 for details about hiding threads.. Set aside the pocket for later. 14. 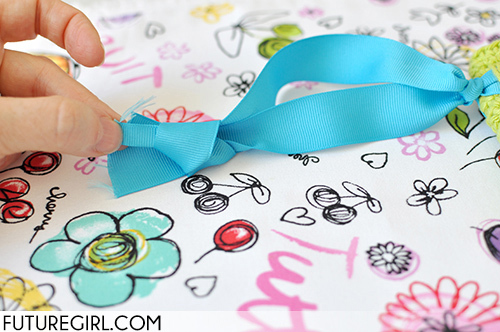 Place one of the lining pieces face down on your ironing board. The long edges are the top and bottom. The short edges are the right and left sides. 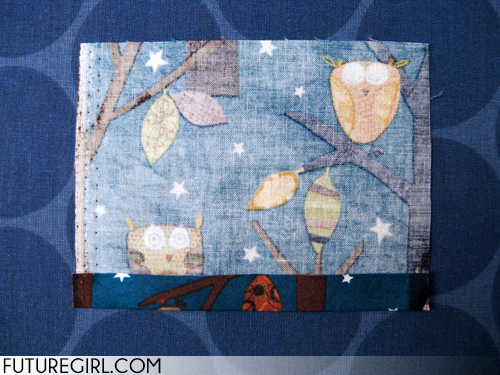 Fold down 1/2" from the top edge, wrong sides together. Iron along the fold. 15. 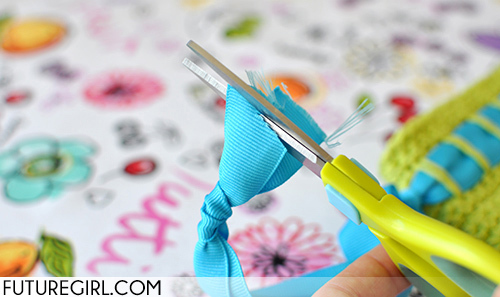 For edges this long which need ironing, I like to make the fold, pin the fold with long pins, then iron. I let the fold cool before unpinning. 16. 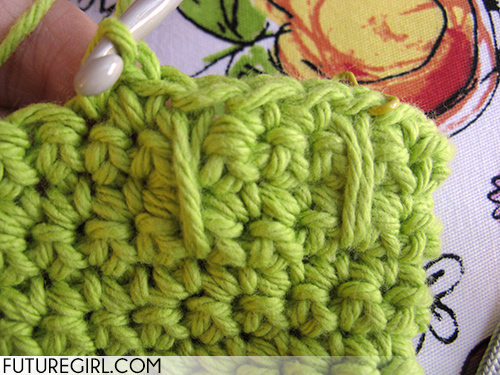 Repeat steps 13 and 14 with the other lining piece. 17. 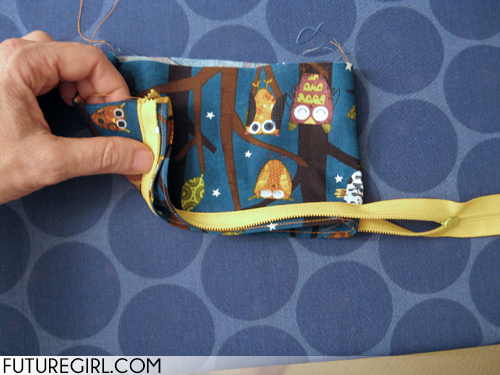 Pin the pocket to one of the lining pieces. 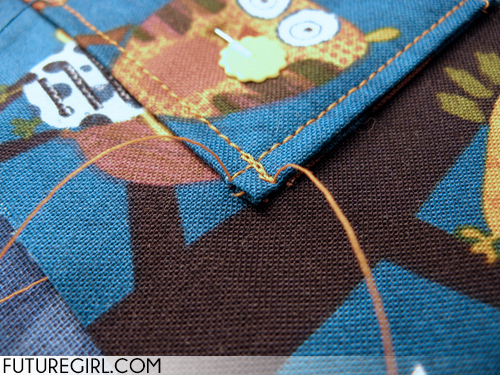 Be sure that the lining piece fold is at the top and the stitching line of the pocket is at the top. 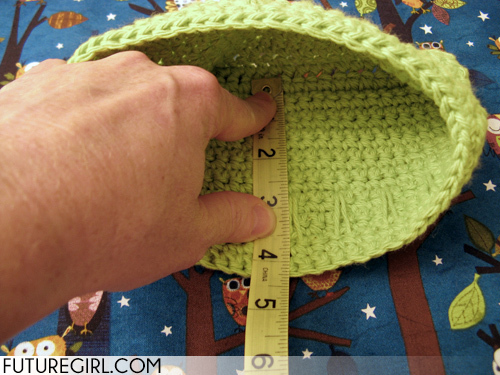 The bottom of the pocket should be about 1" above the bottom edge of the lining piece. 18. 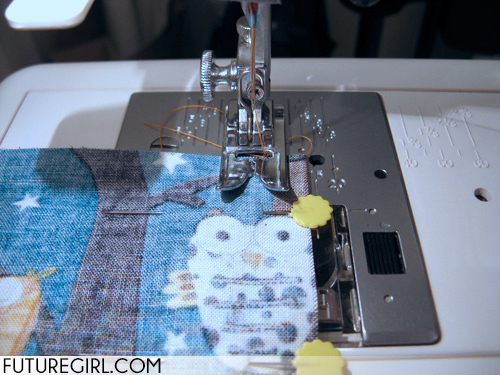 Sew a 1/4" seam along the right, left, and bottom edges. Hide the threads on the back of the lining piece. 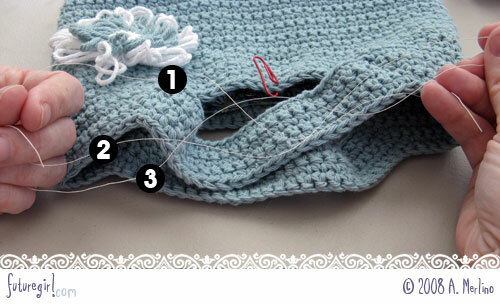 See steps 19-22 for details about hiding threads. 19. These are two thread ends. 20. 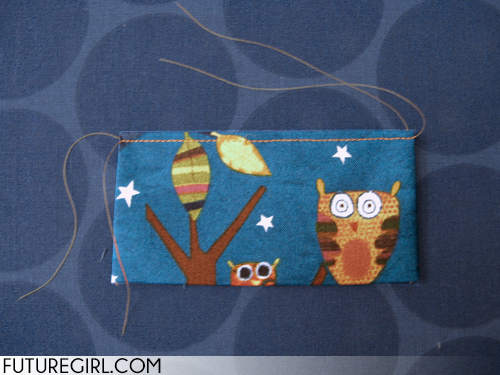 Thread one onto a sewing needle. 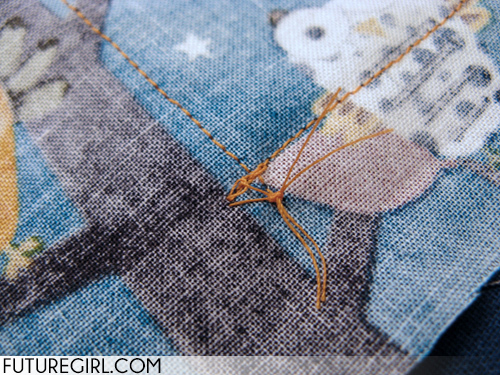 Pull the thread to the back of the lining piece. 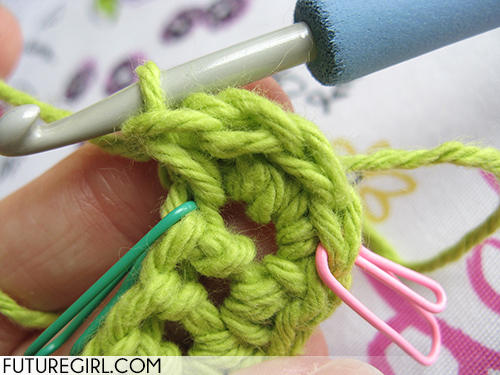 Do this for the other corner thread, too. 21. 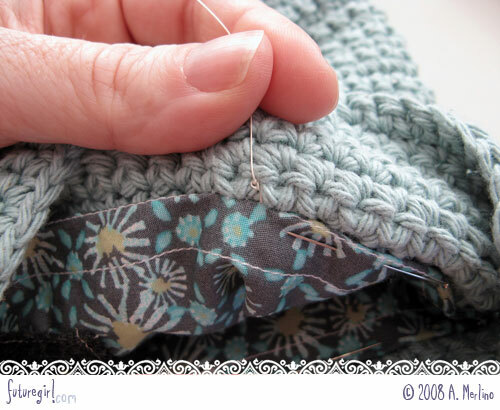 Tie the threads together on the back side to secure them. 22. Here is the neat front view once the threads are pulled to the back. 23. 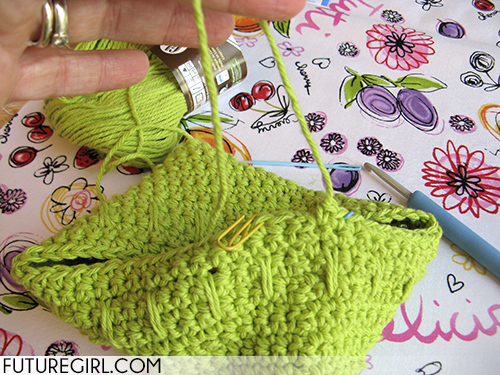 Lay the the lining pieces on top of each other right-sides-together. Pin the sides together. 24. 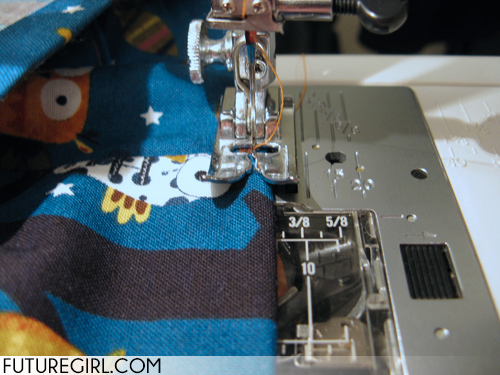 Be sure the two ironing lines at the tops of the pieces line up before you pin the sides. 25. 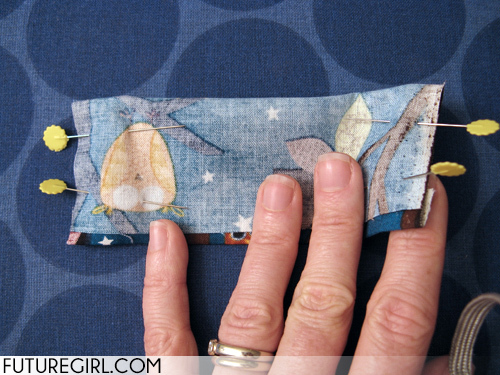 Sew a 1/2" seam on the right and left sides starting from the fold and going toward the open edge. 26. Iron the seam allowance open. 27. 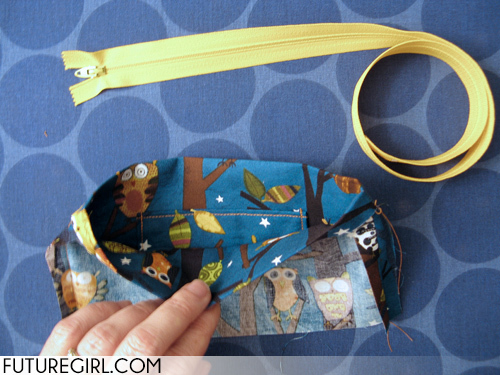 Trim the corners off the seam allowance at the top. This will reduce bulk when we fold down the top edge. 28. 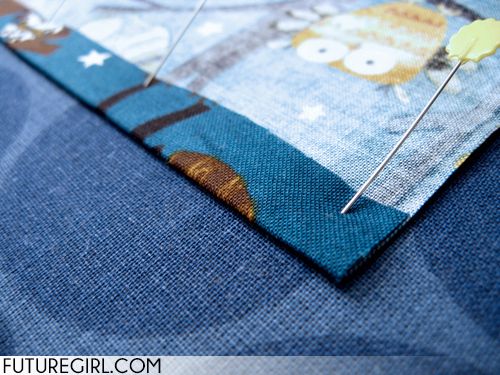 Fold down the top edge along the ironing lines with the side seams still open (to reduce bulk). Iron the top edge again. 29. 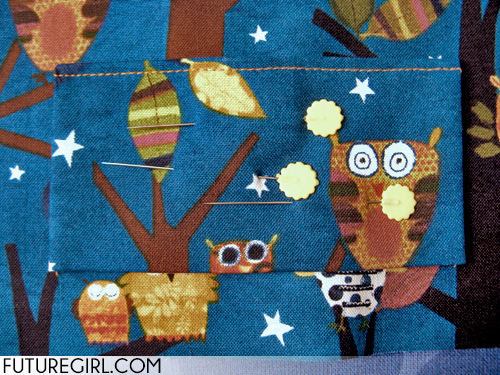 Here's a peek inside the lining at this stage. 31. ... and end at the same point in the side seam. 32. Hide your threads. 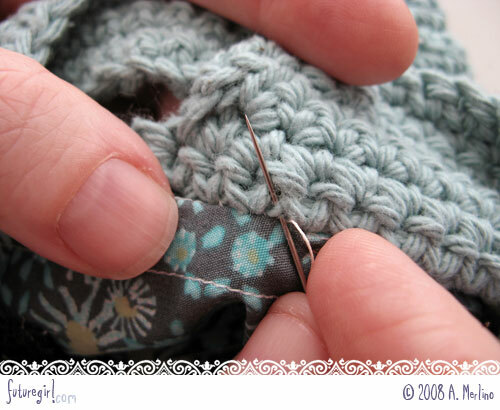 See steps 19-22 for details about hiding threads. 33. Look how neat that is! 35. Turn the lining inside out. 37. ... and place one side of the open zipper so the teeth start right at the 1/2" mark. 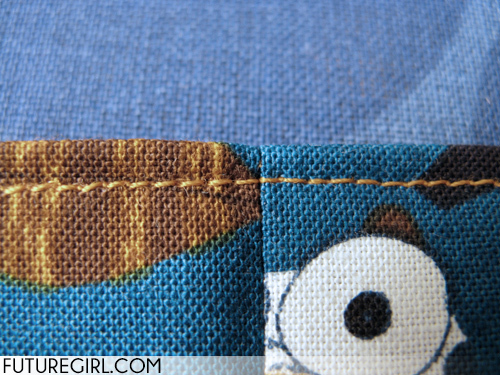 The zipper teeth should be right along your stitching line (1/4" from the top). 38. 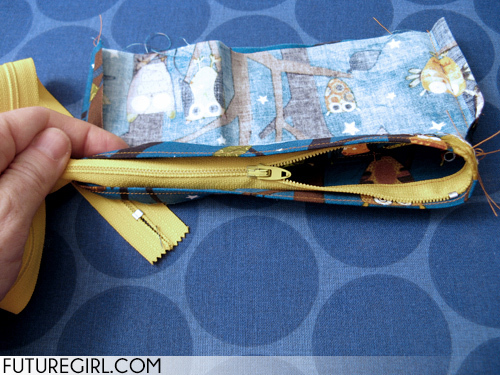 Pin in one side of the open zipper. 39. 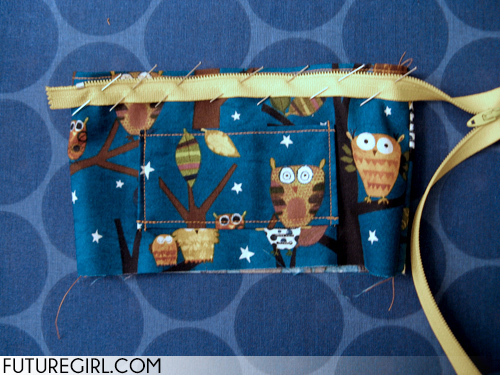 Sew zipper in. Start 1/2" from one edge to 1/2" before the next edge. 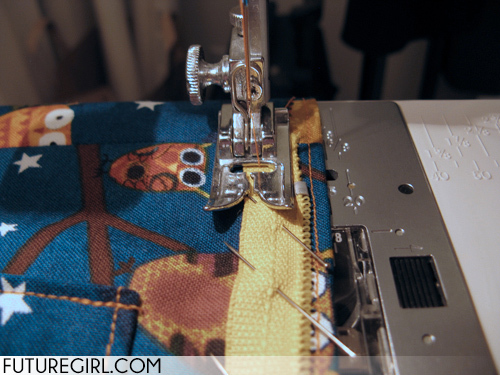 I use my regular zipper foot so that my stitching isn't too close to the zipper teeth. 40. 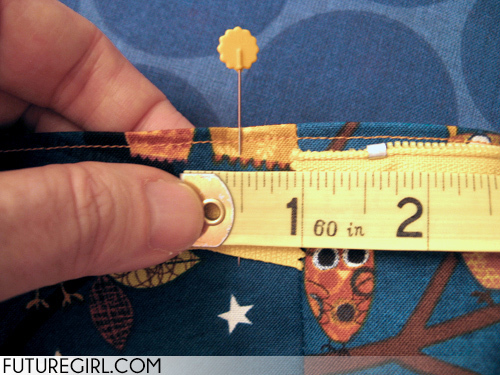 Measure 1/2" from the side seam on the other side of the lining. 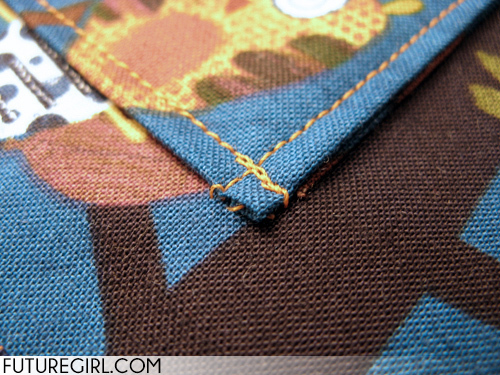 Pin in open zipper. 41. 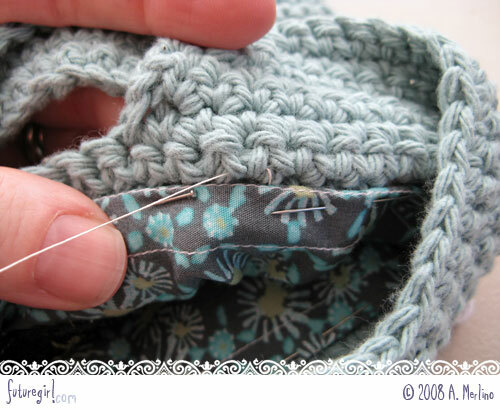 Be sure you haven't twisted up your open zipper before you sew in the second side. When you unzip the zipper that the should teeth point upwards. When you zip the zipper, they should come down and meet in the middle of the bag opening. 42. 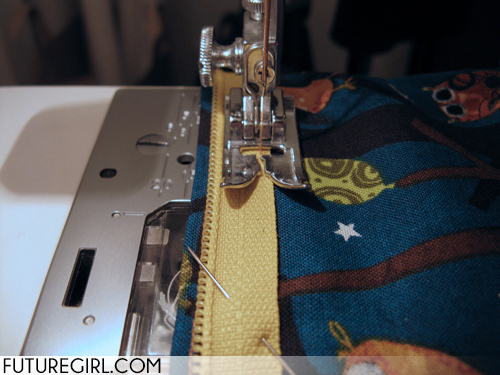 Sew zipper in. Start 1/2" from one edge to 1/2" before the next edge. 43. The zipper is now sewn in. 44. Turn the lining inside out. 45. Zip up the zipper. 46. 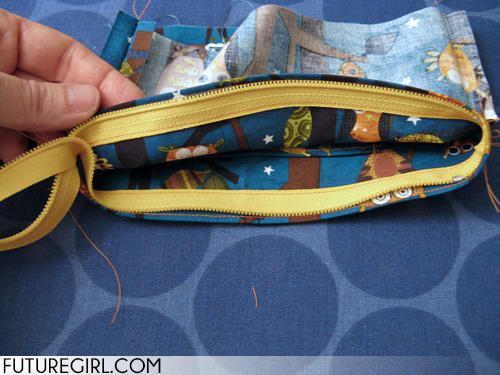 Trim the end of your zipper so it's 2.5" longer than your bag. 48. Now, very carefully, unzip the zipper so the zipper head is in that last 2.5 inches, but don't unzip completely because your zipper head will come right off the zipper and that would be bad. 49. 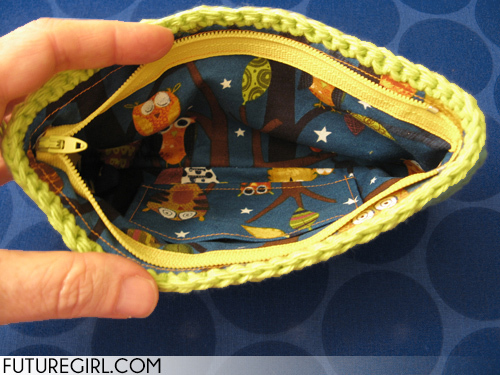 Tuck the 2.5" end of the zipper into the inside of the lining. 50. Zip the zipper back up. 51. The zipper is done! 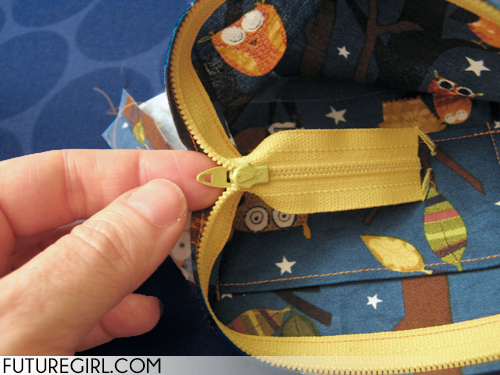 If you have a very loose zipper and you're afraid the zipper head will slip down when you have the wristlet open, you can sew a zipper stop across the teeth at the edge of the bag. 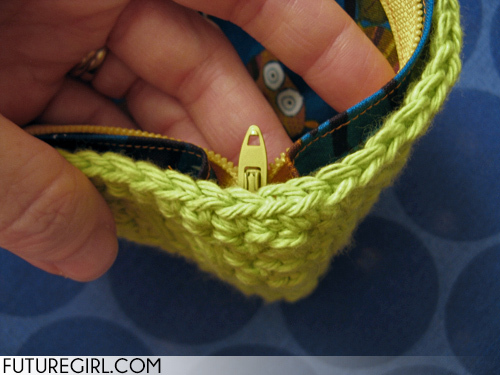 See the section on "Adjusting Zipper Length" in this post at TECHknitting. 52. 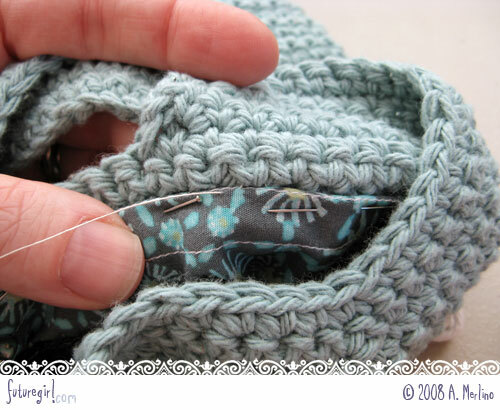 Flatten your lining and pin the bottom closed. 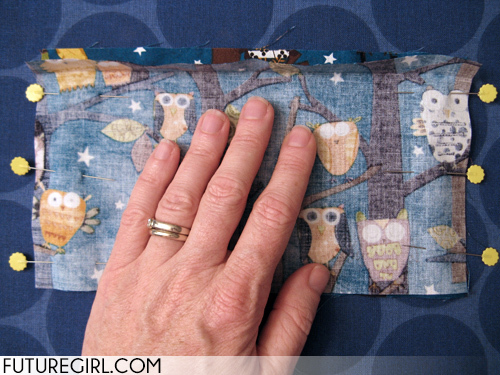 Sew a 1/2" seam across the bottom of the lining. The stitching you can see in this image is back side of the pocket. 53. 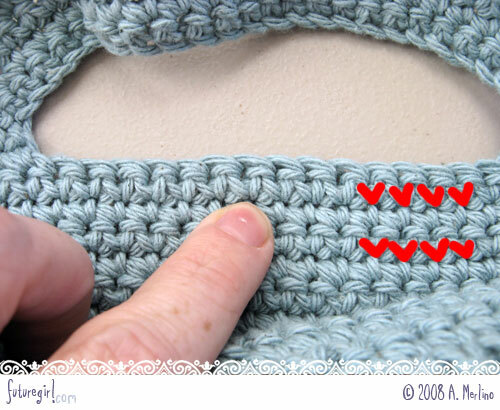 Trim the right and left corners of the seam allowance at the bottom right and bottom left corners. 54. 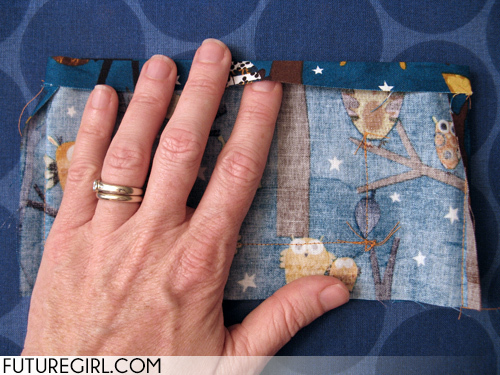 NOTE: If you modified your wristlet to have depth by adding bottom rows, this is the point where you'll want to square off the bottom edge of your lining. 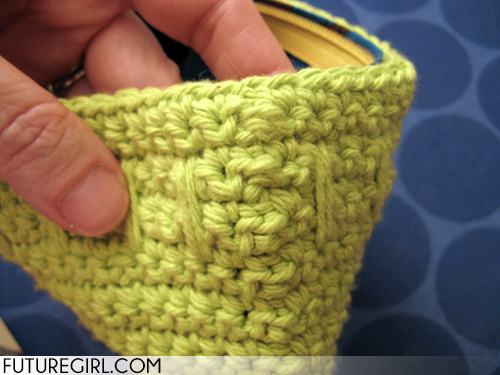 You can see what that entails in my Starling Handbag LiningTutorial steps 7, 8 and 9. 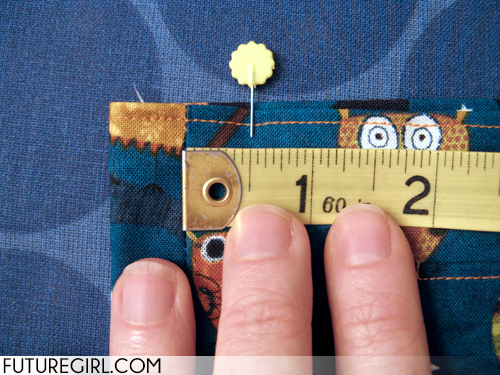 Once you fold over the edge in step 8, measure across the triangle perpendicular to the seam. 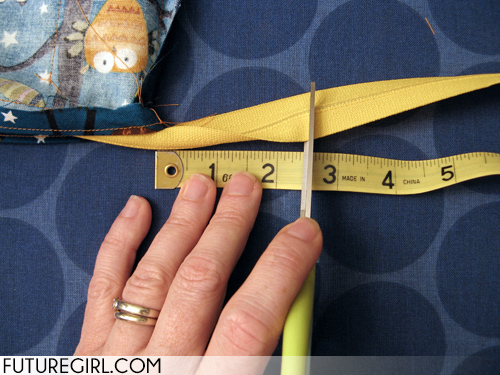 When you find the spot where the measurement matches the depth of your bag, that's where you'd stitch as shown in step 9. 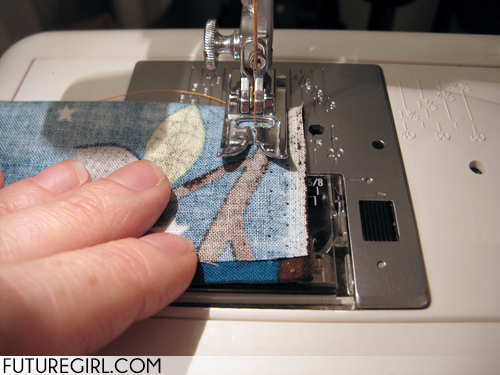 Then trim off the excess fabric. 55. 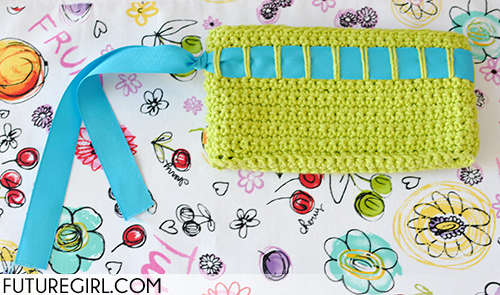 Put your finished lining into the crocheted wristlet. 56. 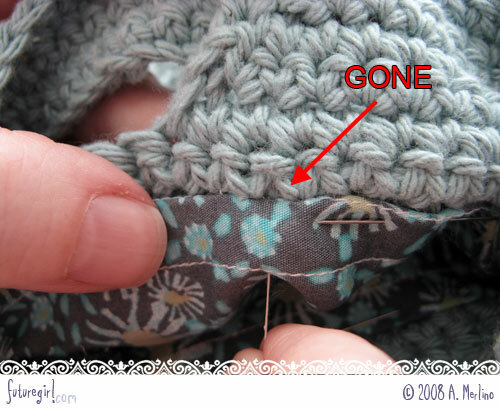 With the zipper open, the zipper head should be on the side with no spike crochet stitch. 57. See? 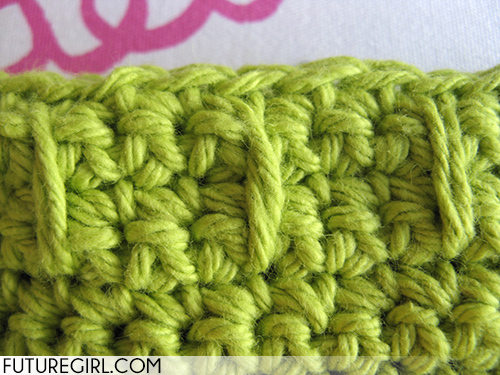 There is no spike crochet stitch on the edge here. 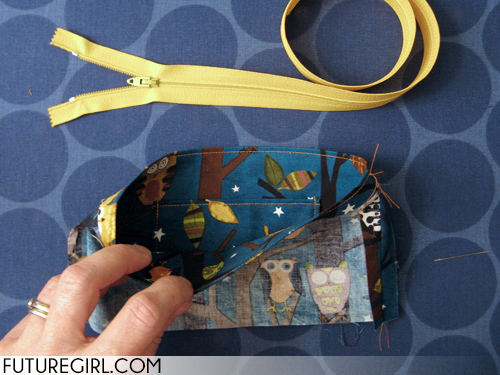 I have a very detailed tutorial for sewing in a lining for a Starling Handbag. Instead of making you go back and forth between these two tutorials, I'm going to borrow images from that tutorial to illustrate a couple things below. 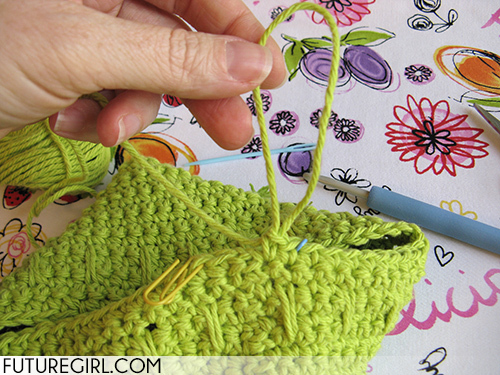 Don't be confused by the different crochet colors and lining. 58. 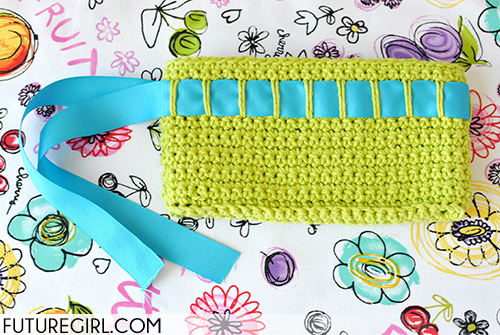 Find the crochet row where you will be sewing the lining into the wristlet. Pin in the lining. 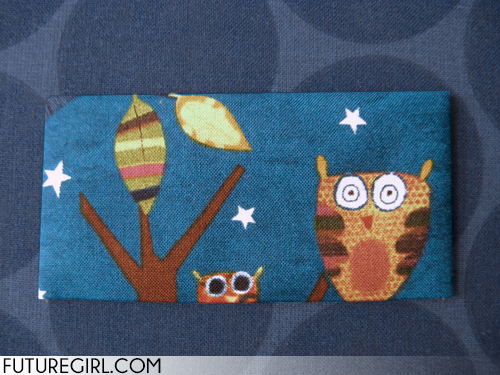 For the wristlet, it should be the very top row. 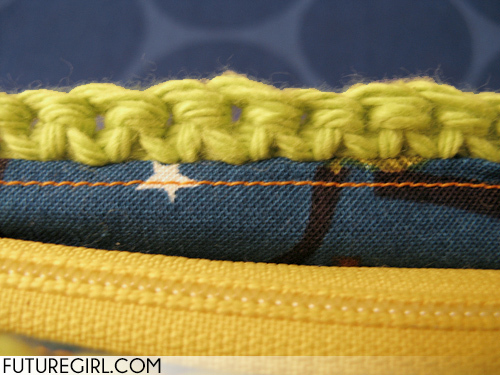 Be sure the right and left edges of your wristlet are aligned with the left and right edges of your lining. 59. 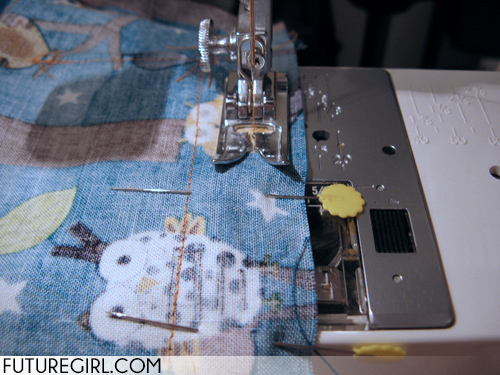 I marked the rows with red Vs to show you the stitches you'll be sewing the lining to. 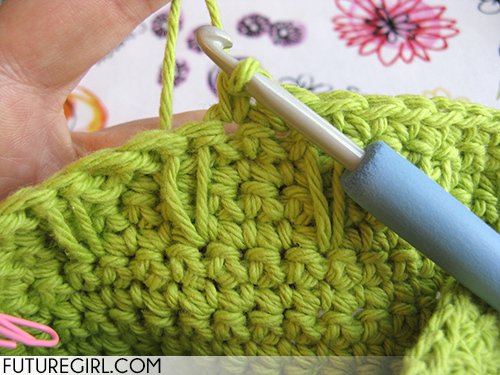 You will only have rows that look like this if you crocheted back and forth (which you should have done). 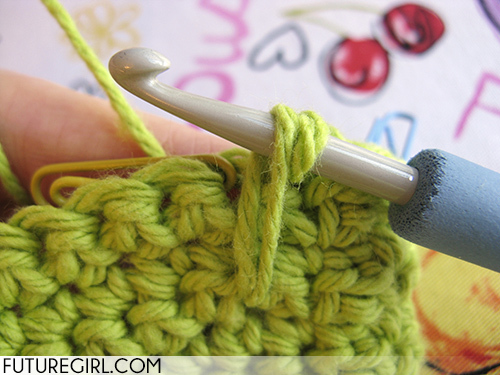 You'll be using the one I'm pointing at, which is the top row of single crochet. 60. 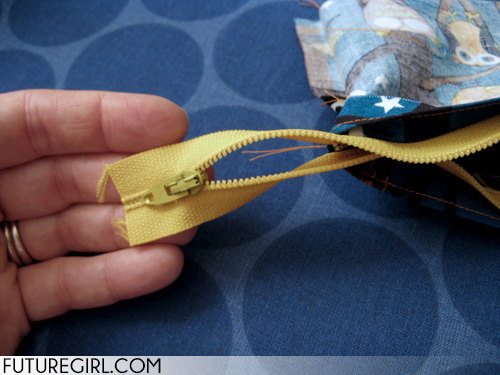 Cut a length of thread that is 3 times the width of your wristlet. 61. 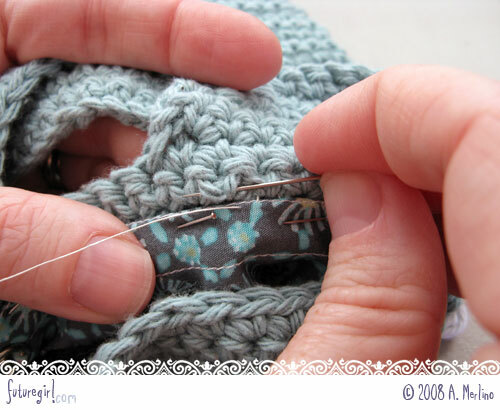 Thread your needle and knot the thread. 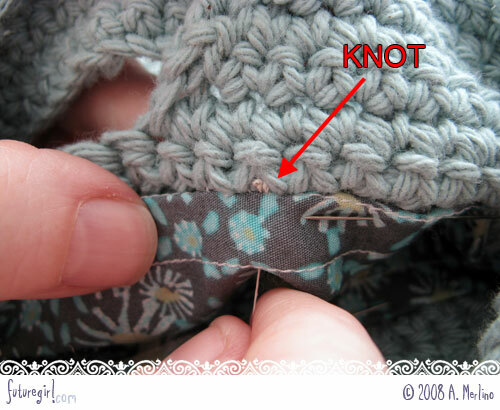 This knotting tutorial is awesome. 60. 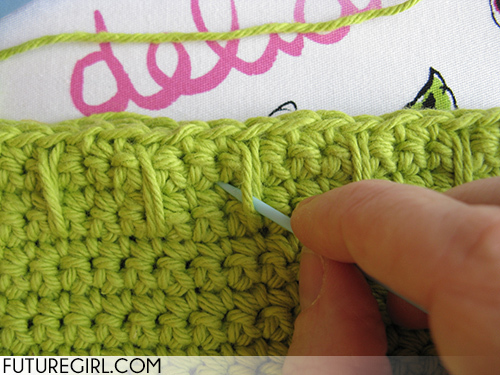 Come out of the top edge of your lining right at a spot that lines up with the right side of one of those Vs. 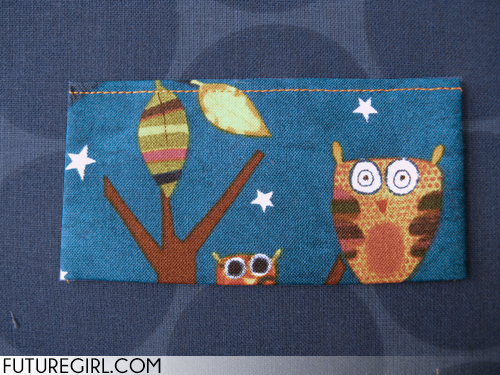 This will hide the knot between the lining and your wristlet. 61. Here it is from the front. See that the thread is right between two of the Vs.
62. 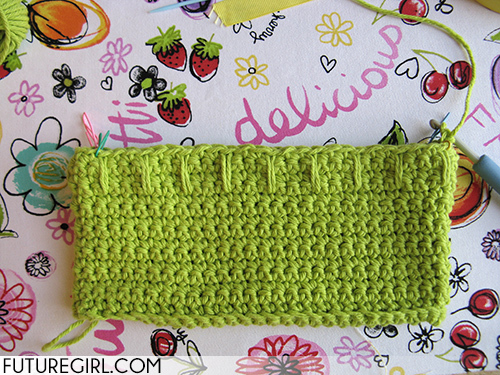 Make a stitch behind the two vertical bars of the crochet stitch V.
63. You are just catching the two vertical bars. 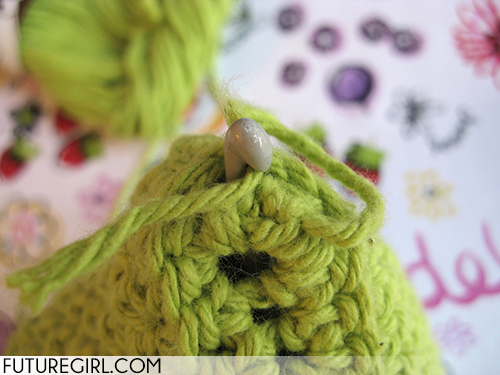 Do not go through the crochet to the outside of the bag. This part is not an exact science. You don't have to get *all* of the yarn in the vertical bars ... just most of it. 64. Pull the needle and thread through. 66. 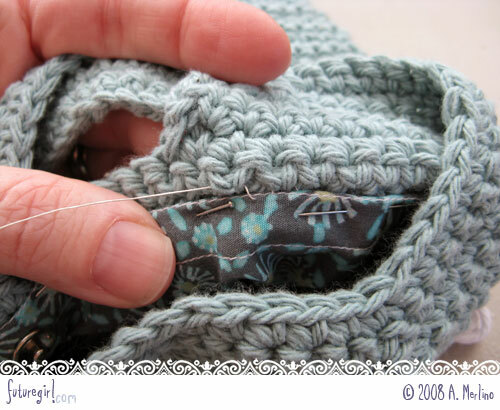 Put the needle into your lining so it's inside the top fold and comes out right at the edge of the next set of vertical bars. 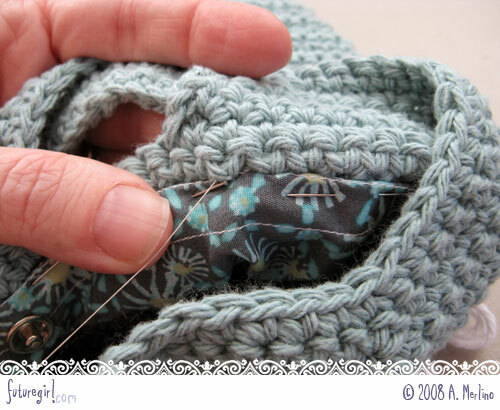 The needle is sandwiched inside the fold of the fabric. I do not go through both pieces of folded fabric. 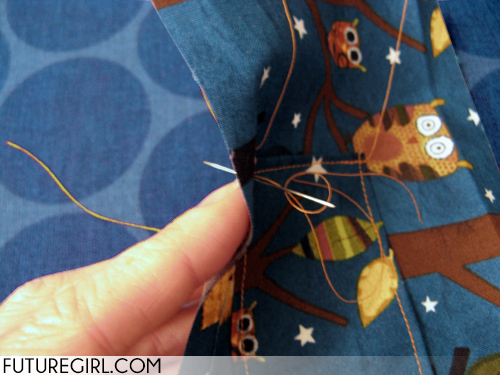 If you looked behind the needle, between the lining and the bag, you wouldn't see the back side of the needle because it's inside the folded fabric. I've said the same thing four times here because I'm trying to be clear, because it is a tricky thing to explain in words. 67. Pull the thread through. 68. 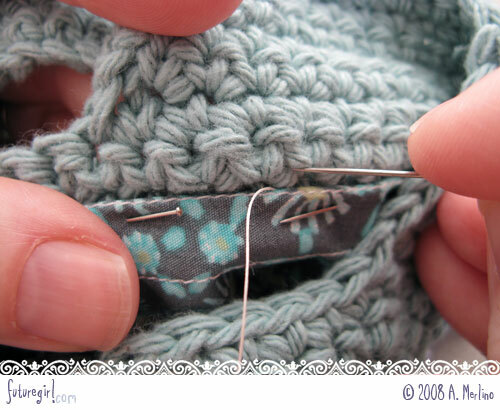 Make a stitch behind the next set of vertical bars. 69. Pull the thread through. 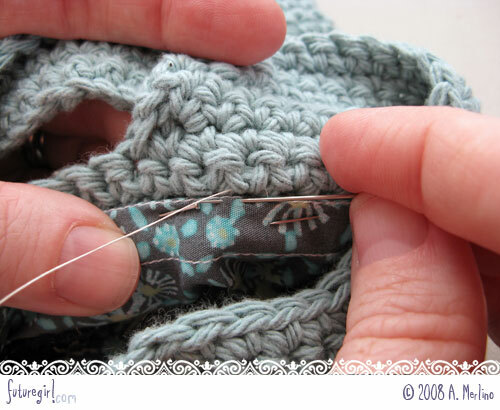 70.Pull your stitches tightly as you go. 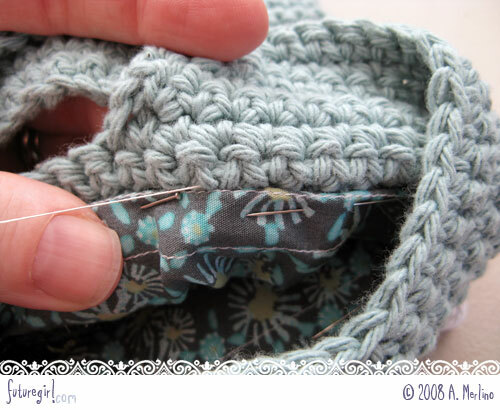 When the stitches are pulled tightly, your lining will looked tucked into the crochet. 73. 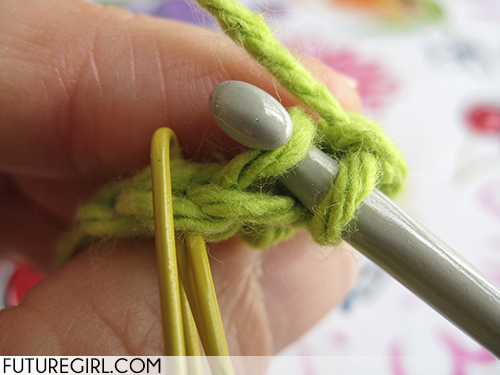 ... and pull the thread through the wraps to create a knot. 74. 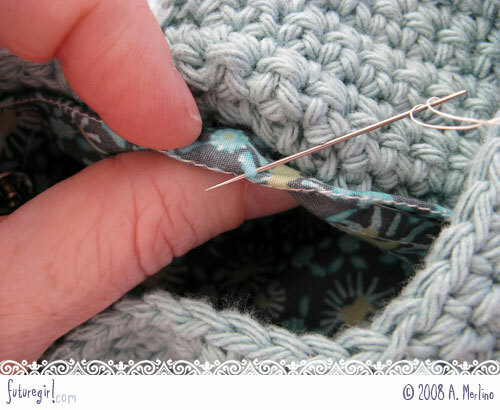 I hide the knot by pulling my needle and thread behind the lining. 76. ... and pull it to hide the knot behind the lining. 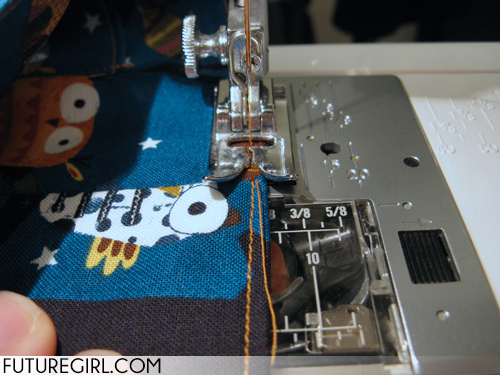 Trim the thread end. 77. 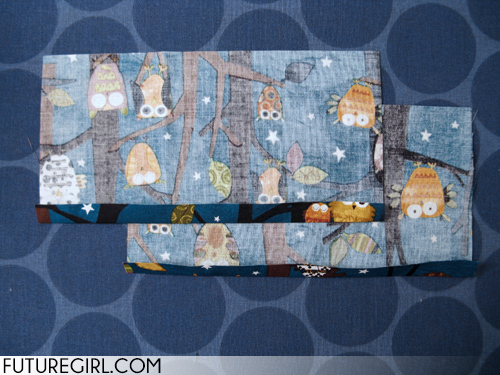 Here is the wristlet lining after being sewn in. 78. And you're done! Time to add the ribbon strap. 3. 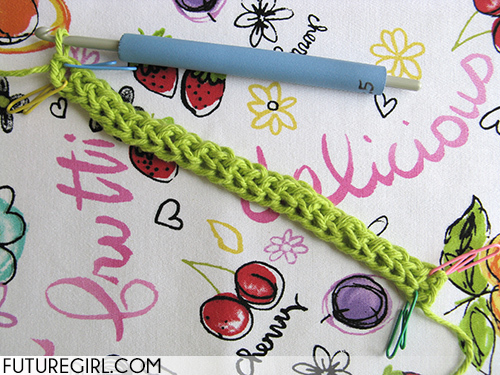 Once I'm done with the FSC foundation row, I put a stitch marker in the top and bottom of the last FSC. 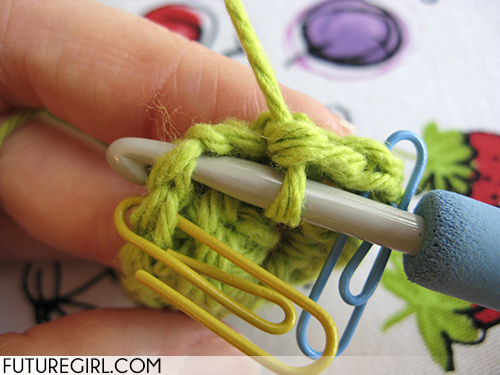 In the photo, I have put a blue stitch marker in the top of the FSC and a yellow stitch marker in the bottom or the FSC. 5. 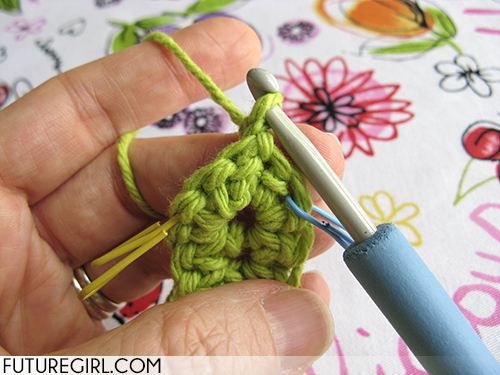 Turn your work clockwise (without moving or letting go of your crochet hook). Look at the photo above. Look at the photo below. Just flip your work from right to left. 6. Now we are starting Row 1. 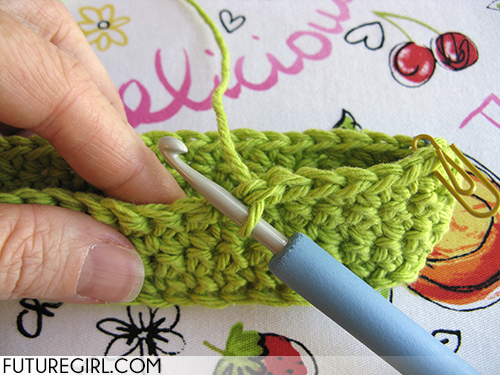 Make 3 single crochet stitches in the top of the FSC closest to your crochet hook. 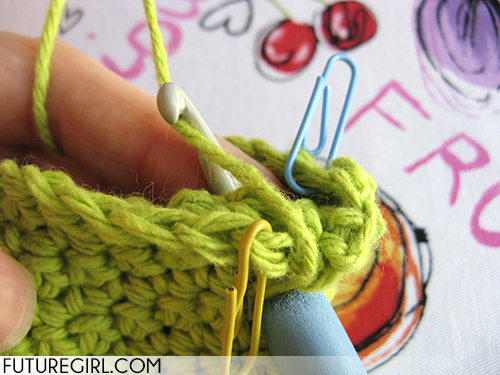 If you are using the stitch markers like I am, then it will have a stitch marker in it. 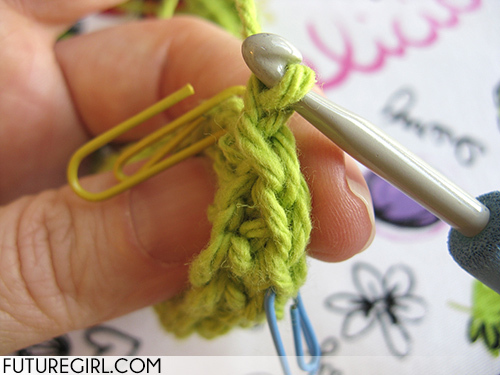 The stitch marker for this stitch in the photo is a blue paper clip. 7. 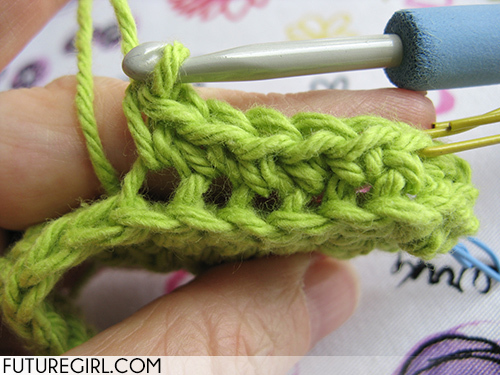 Make single crochet stitches across the foundation row in the tops of the FSC stitches. 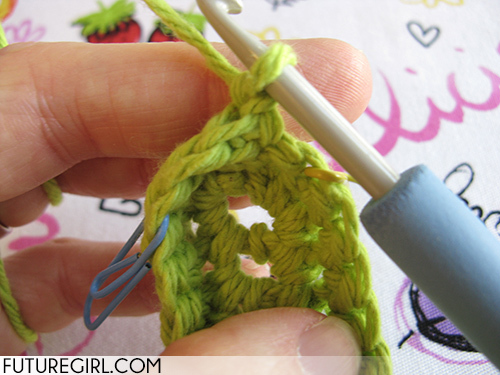 Move the stitch marker up to the middle (aka 2nd) single crochet of the corner stitch. 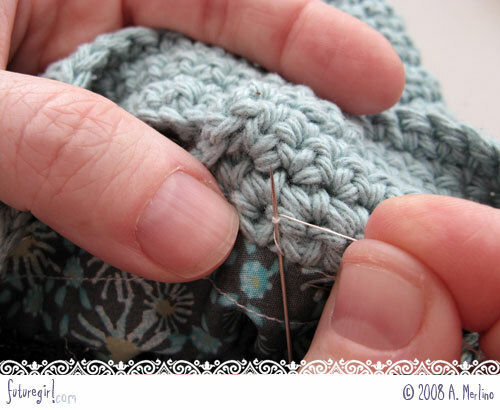 This is useful if you need to recount stitches because something is off later. 8. 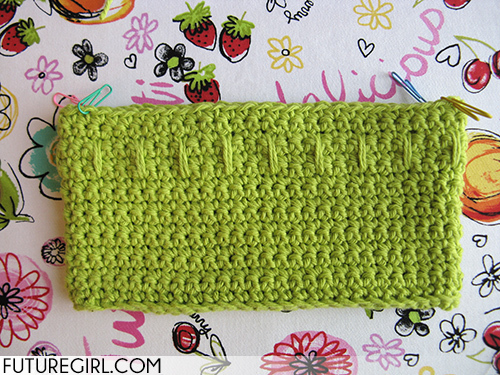 When you get to the last FSC stitch, you will make another corner (3 single crochets) in the top of it. 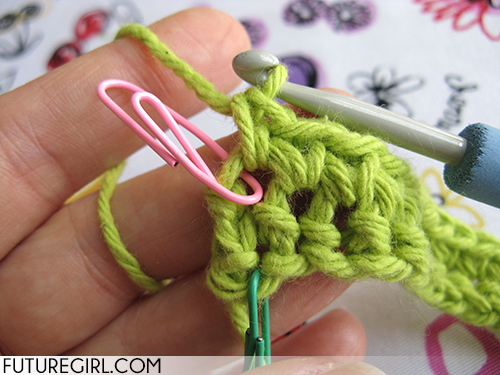 That will be in the stitch with the pink stitch marker. 11. 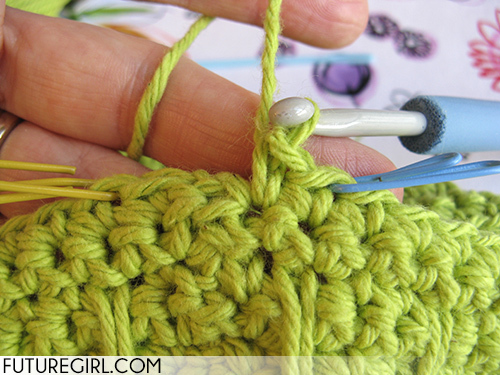 ... three single crochet stitches in the top of the first FSC of the foundation row to make a corner. 12. Chain one. 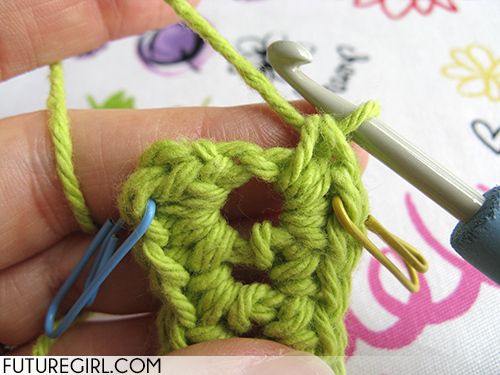 Move the stitch marker to the middle (2nd) of the three corner single crochets. 13. 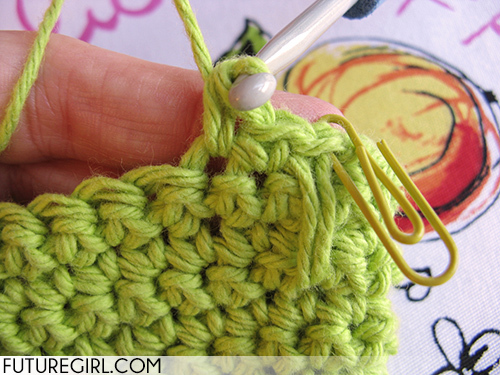 See the single strand of yarn over my hook? That's yarn that goes across the center of the FSC row. 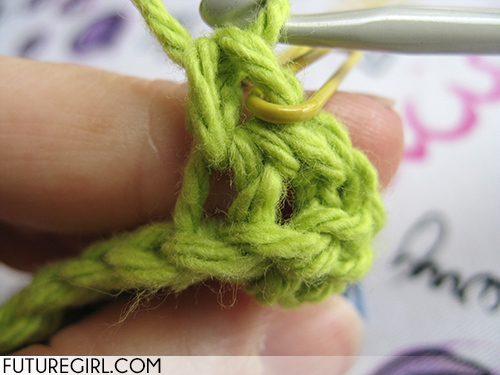 When you make the single crochets across, make them around the single yarn and the bottom of the FSC stitches. 16. 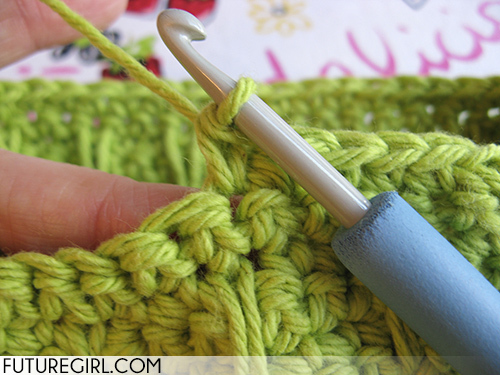 ... three single crochets in the bottom of the first FSC of the foundation row to make a corner. 17. 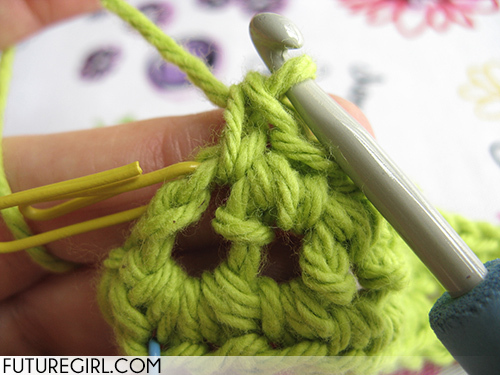 Move the stitch marker to the middle (2nd) of the three corner single crochets. 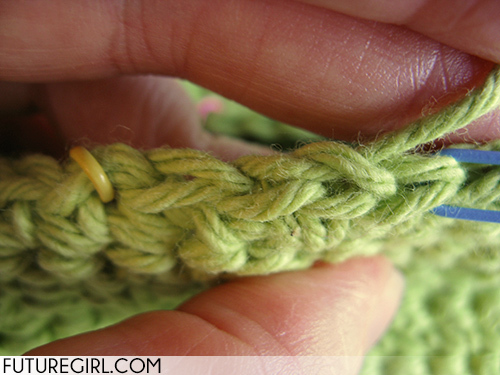 You can see that single strand of yarn between the top and bottom of the FSC stitches. 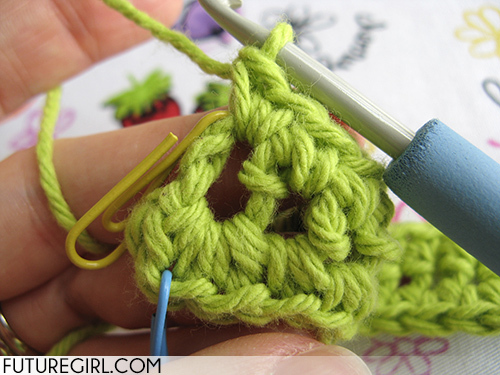 Just be sure to stitch around it as you go across so it's caught in your single crochet. 19. 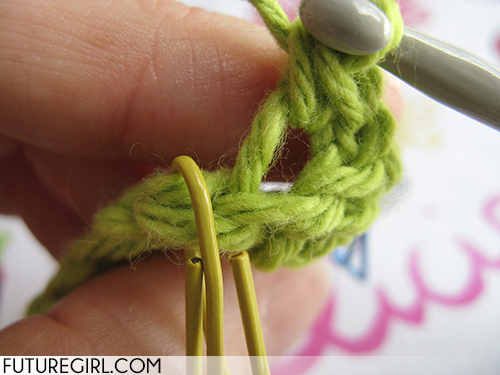 When you get to the bottom of the last FSC, you're going to make another corner where the yellow stitch marker is. 22. 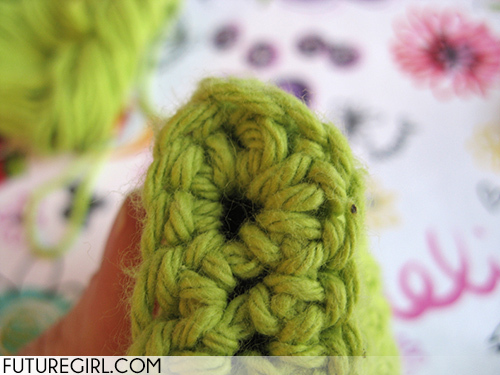 ... three single crochets in the bottom of the last FSC to make a corner. 23. 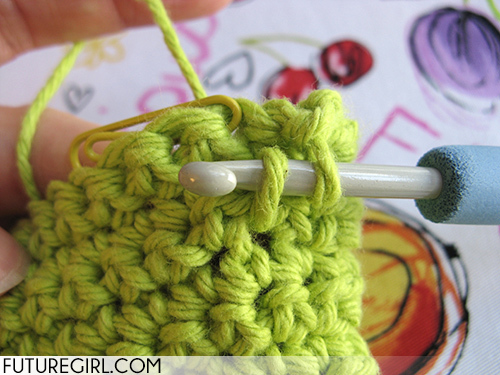 Move the stitch marker to the middle (2nd) of the three corner single crochets. 24. 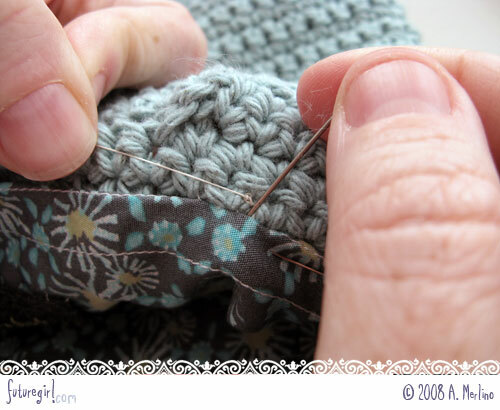 Now we are going to connect the end and beginning of this row with a slip stitch. 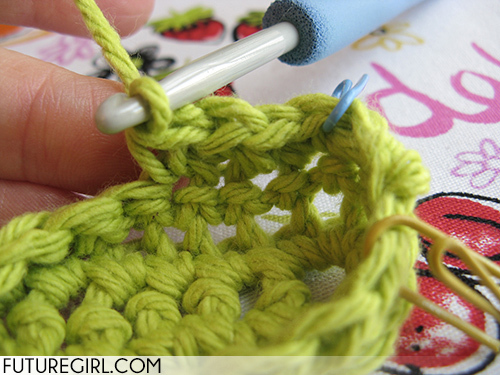 This is a seamless single crochet technique that I came up with. 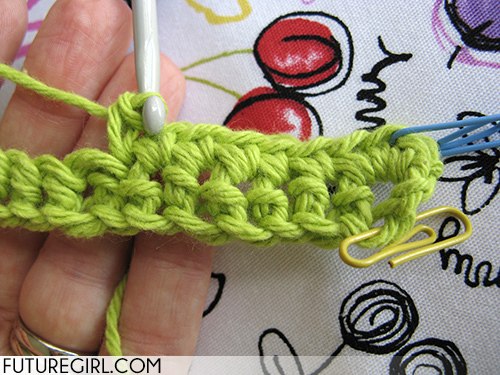 If you aren't familiar with it or if you'd like to learn how to do joggles color changes take a look at my seamless single crochet tutorial. 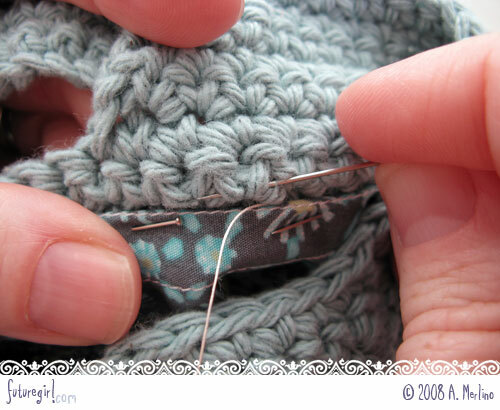 Put your hook in the top of the first stitch of the row and yarn over. 25. 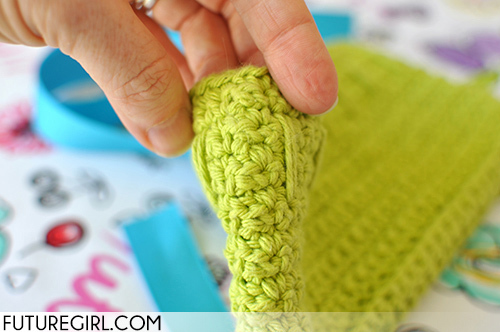 To complete the slip stitch, pull the yarn-over through the top of the first single crochet and through the loop that was on your hook. 26. Now we're starting Row 2. Chain one. 27. 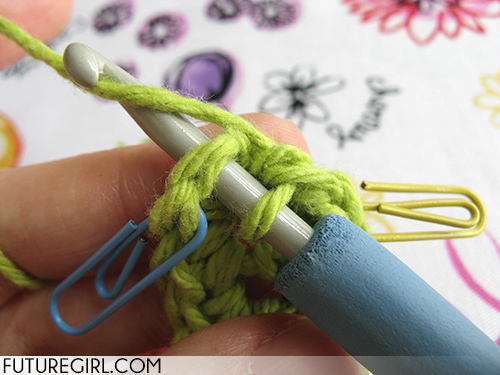 To turn your work clockwise, keep your hook in your right hand, use your left hand to spin your work so the right edge moves toward you then to the left. 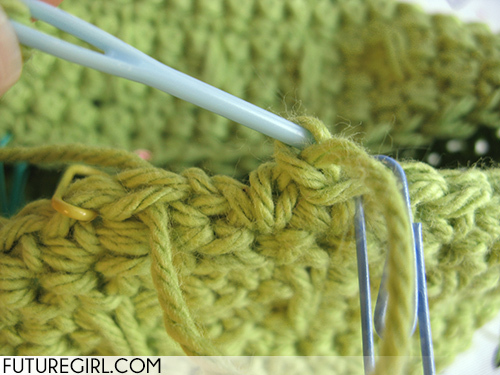 If this isn't making sense to you, take a look at where the yellow and blue stitch markers are in photos 26, 27, and 28 ... they are moving as the work is turning clockwise. Just imitate the images. 29. 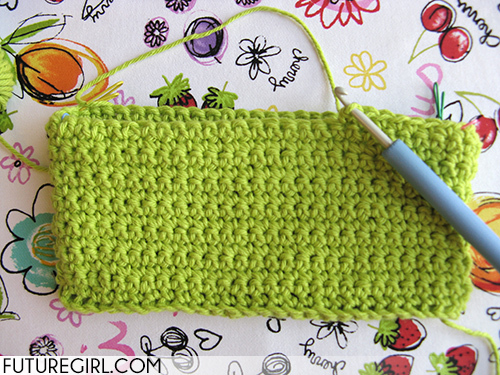 Now, we are going to skip the slipstitch we just made and make a single crochet into the last single crochet of Row 1. 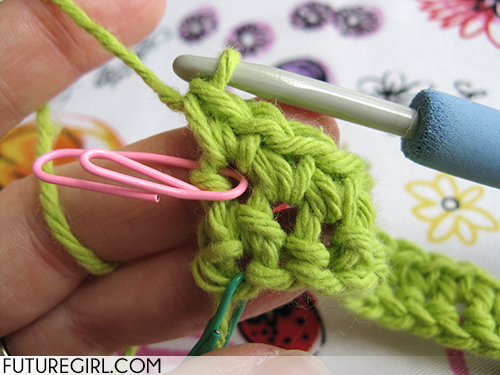 We're also going to make that single crochet into the farthest (back) loop of that single crochet. 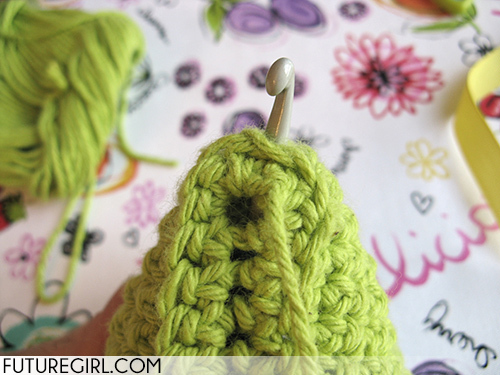 In this photo, I've put my hook into the back loop of the last single crochet. 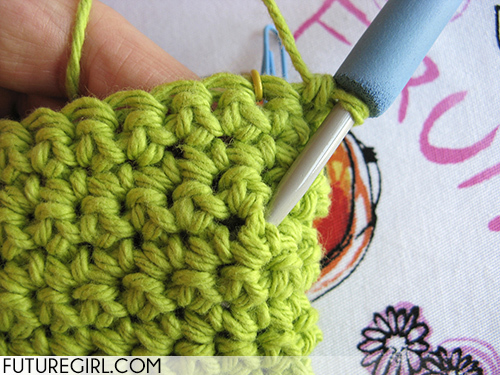 See how putting the stitch market into the middle of that corner helps me see which stitch I should be crocheting in? 30. 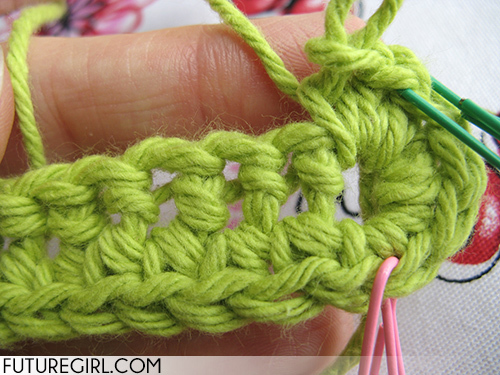 Finish the single crochet around the back loop. 31. 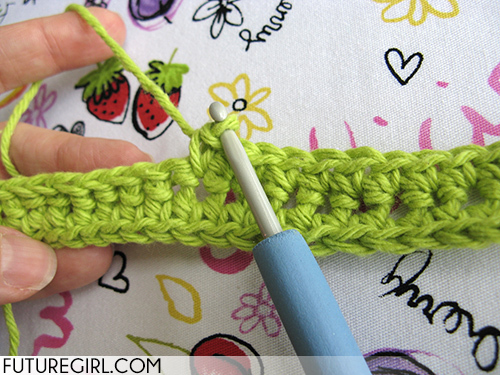 Make the next single crochet through the back loop. 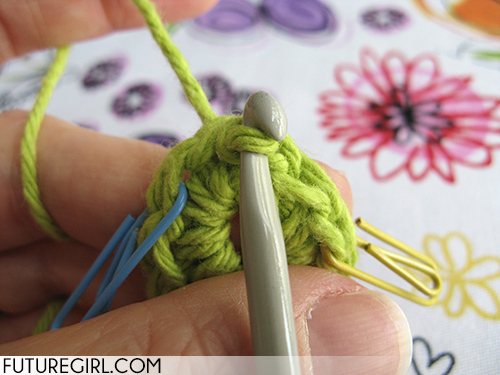 Move the stitch marker to that stitch. Keep moving the stitch markers up every row. 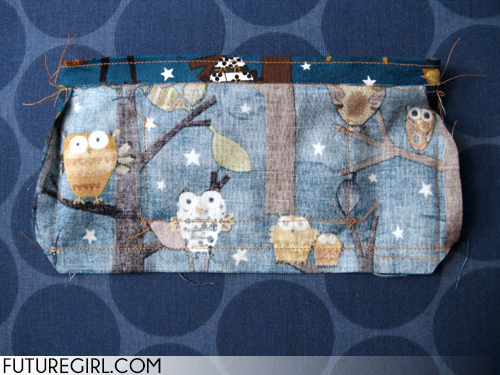 They come in handy when pinning in the zippered lining. 32. 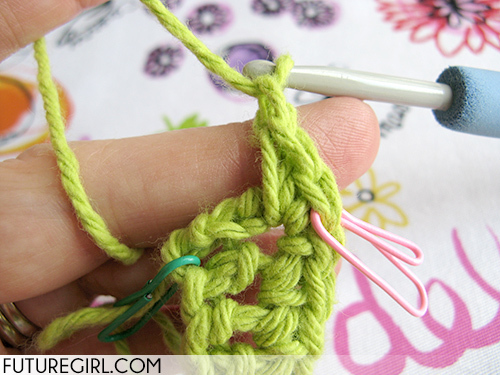 Keep single crocheting around in the back loop. 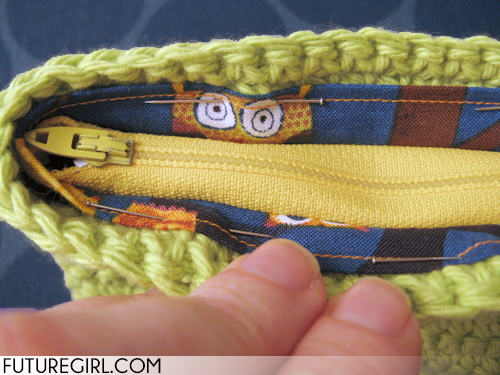 There will be a nice edge around the bottom of your wristlet created by the front loop that is getting left behind. 33. This is the last single crochet of the row. 34. 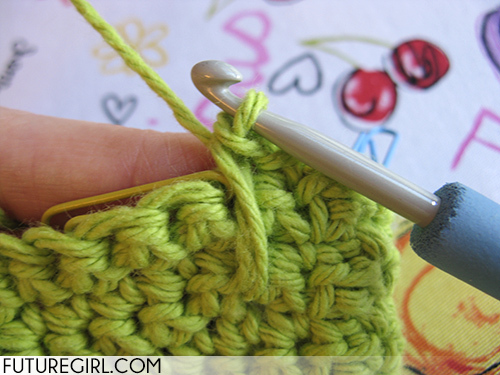 Put your hook into the top of the first single crochet of the row. 35. 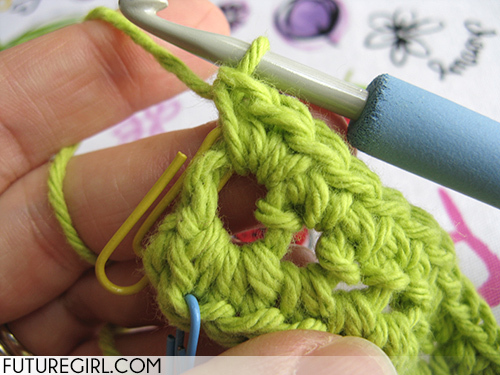 Complete the slip stitch by yarning over and pulling it through the single crochet and the loop on your hook. 36. Now we are starting Row 3. Chain one. 37. Turn your work clockwise. 39. 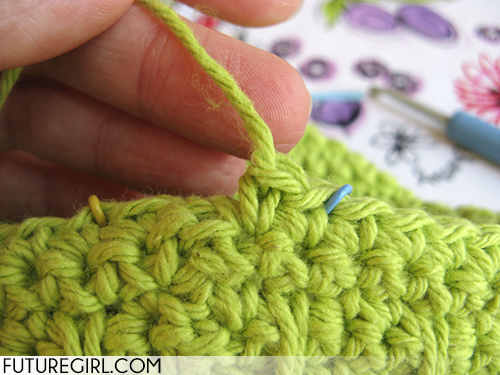 Skip the slip stitch you just made and single crochet in the last stitch of the previous row. 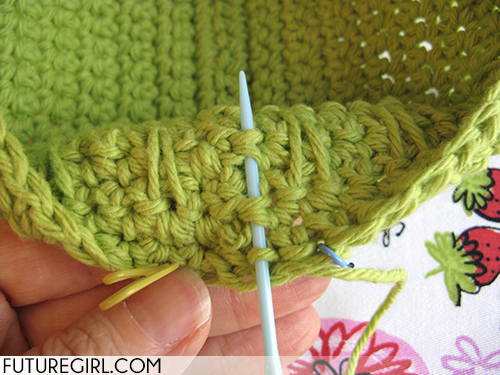 For this row (and all subsequent rows) you will single crochet under both loops of the stitches of the previous row. 40. 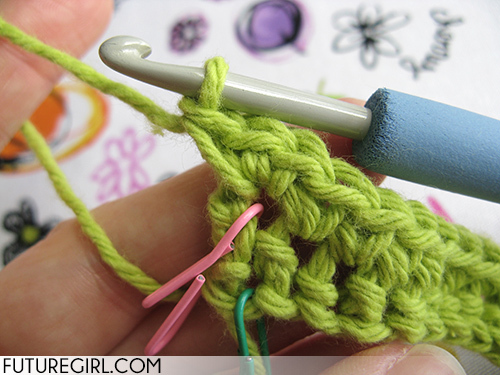 Single crochet around. 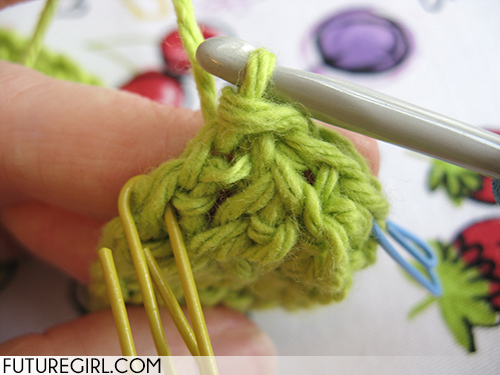 Keep moving the corner stitch markers up each row. 41. The sides will start building upwards. Go back to step 33 until you get to Row 16. 43. 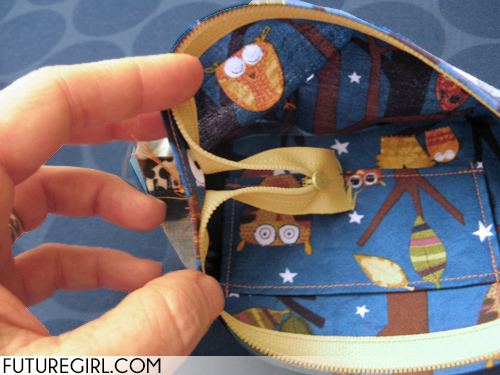 Here's what the inside of your wristlet should look like at this point. 44. Row 17 has been started and we've chained one, turned the work clockwise, and made one SC. Here's where things get exciting! 45. 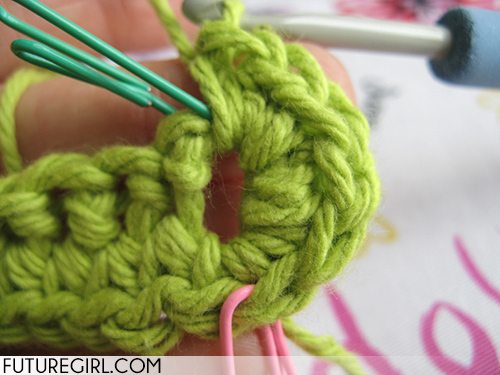 You are going to make a "spike single crochet" stitch. 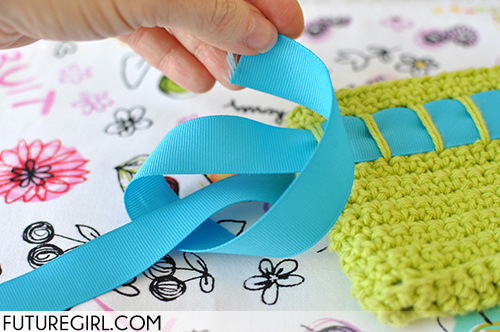 It will serve as a "belt loop" for your ribbon strap. 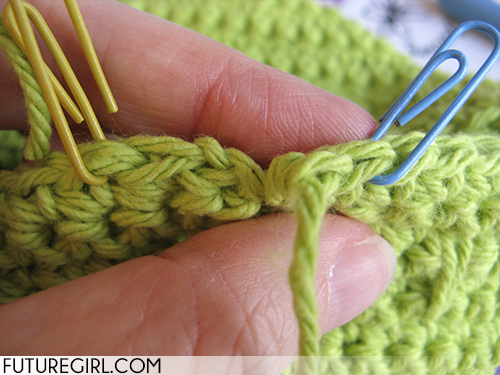 Make a guess about how many rows down you should make your spike stitch and count down the rows from the yellow stitch marker. 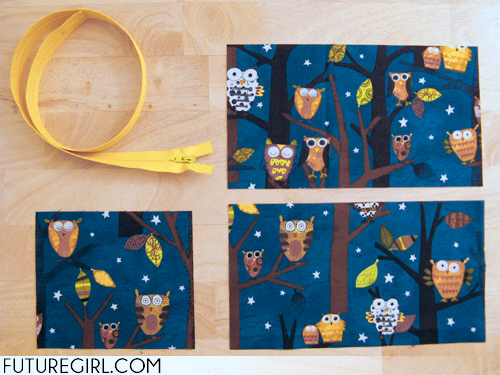 I need to go down 3 rows to accommodate my 1-inch ribbon. 46. 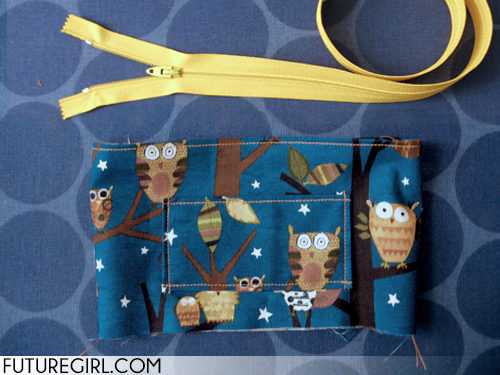 I've put my hook into my wristlet 3 rows below the current stitch (the one with the yellow stitch marker). 48. Pull the loop through your work. 49. 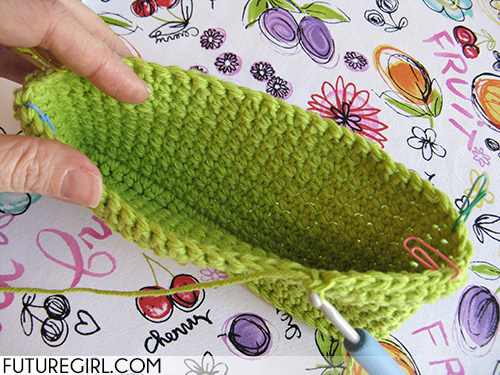 Stretch the loop up to the current row's height. 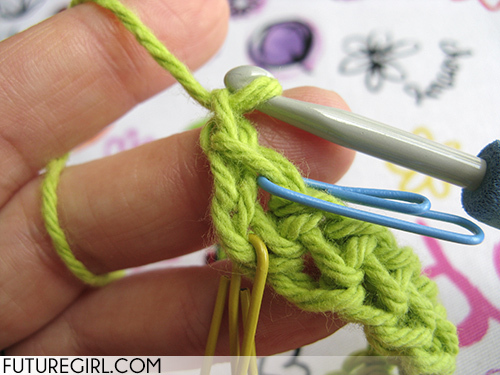 It's important to make sure the loop that was already on your hook is still tight and didn't get stretched out. 51. 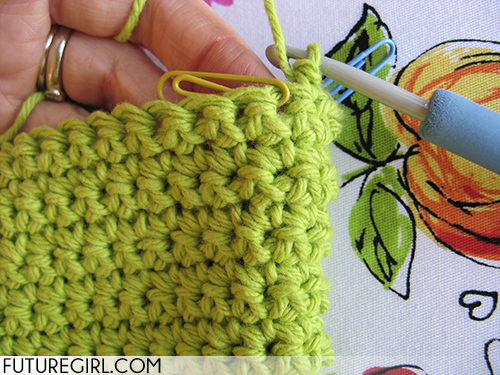 Complete your single crochet. 52. 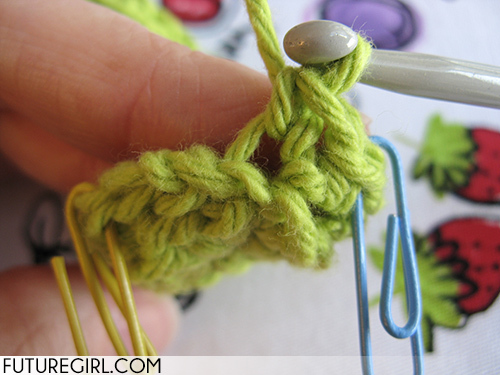 Move the stitch marker up. 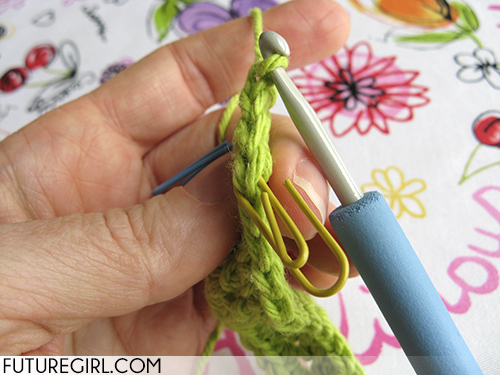 Make the next single crochet. 53. 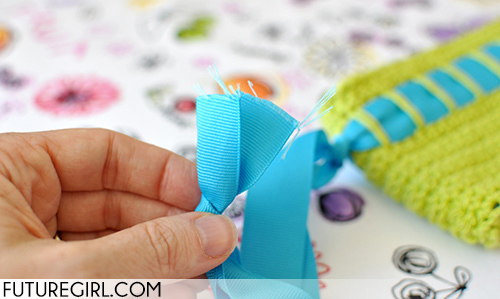 This would be a good time to make sure your ribbon fits in the spike stitch the way you'd like it to fit. 54. Perfect! Not too much space to slip around and not too little space so that it's buckled. 55. 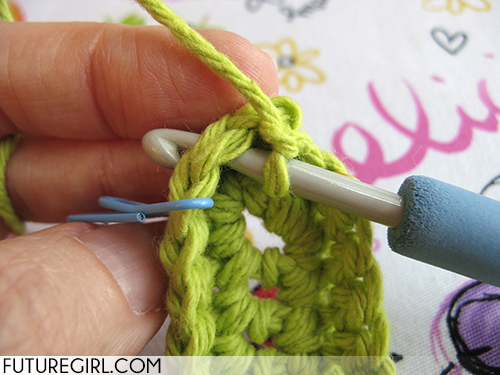 Make the next single crochet. 56. 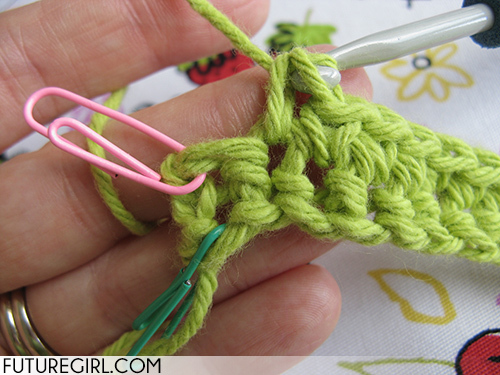 Make another spike single crochet the same height as your first one. 57. 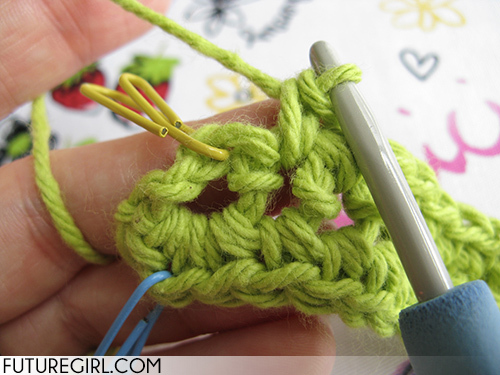 Often, my spike single crochet "spikes" have strands that are twisted around each other, like here in this photo. 58. 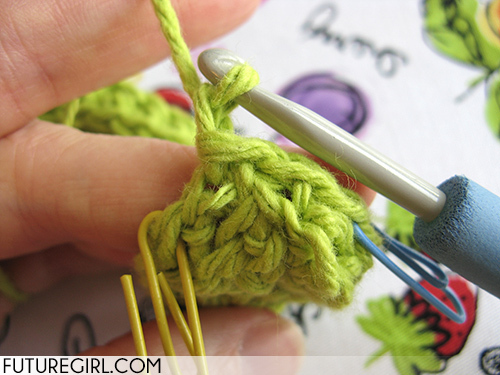 I use a plastic yarn needle to gently straighten them out so they look neater. 59. Row 17 complete with spike stitches straightened. 61. 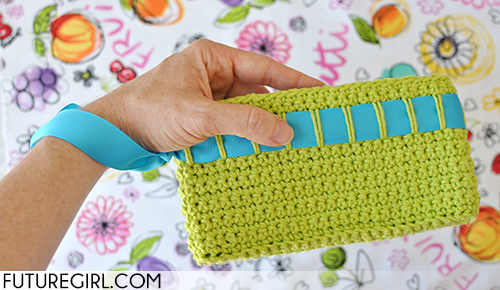 This is a photo of me crocheting Row 19 showing the outside of the wristlet. 62. This is the last single crochet of Row 19. 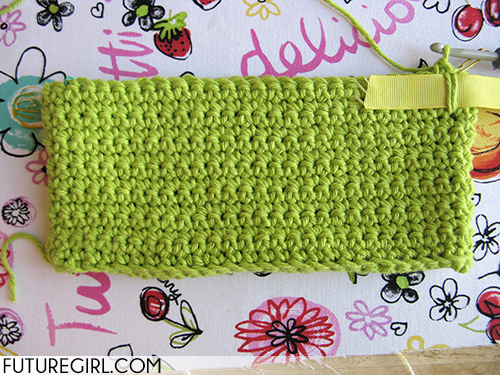 We are going to do what I call weaving in the last end (that's a link to my tutorial). 63. 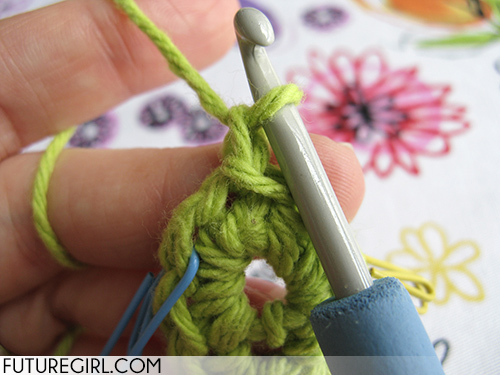 Take your hook out of the loop and pull the yarn to make a huge loop. 64. 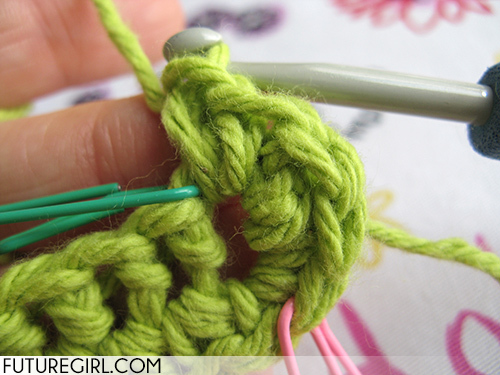 Cut the end of the yarn coming from your skein and the pull the loop so the cut end goes through the top of the last single crochet. 65. Closeup of the side. 66. Closeup of the top. 67. 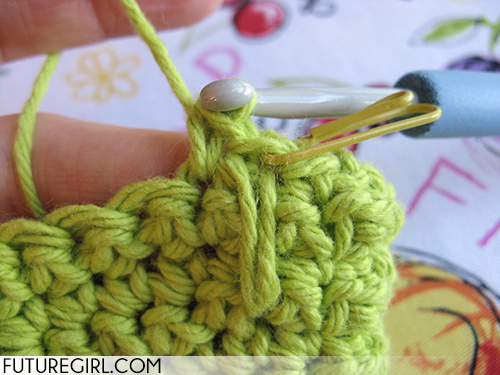 Thread this tail onto a yarn needle, then put the needle under the top two strands of the first single crochet of this row. 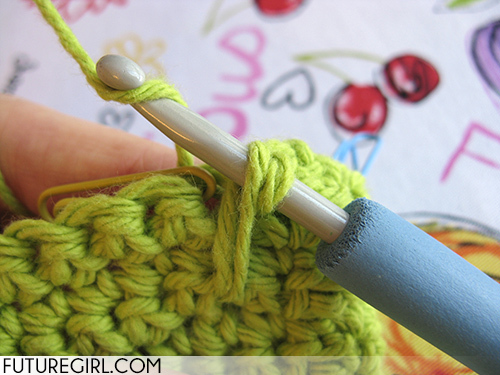 It's the same place you would have put your crochet hook if you were going to make a slip stitch. 68. 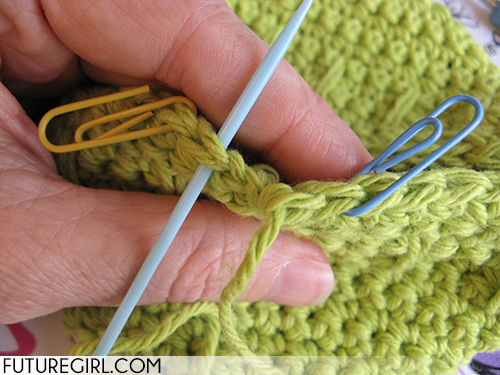 Put the needle into the top of the last single crochet where the yarn strand starts. 69. 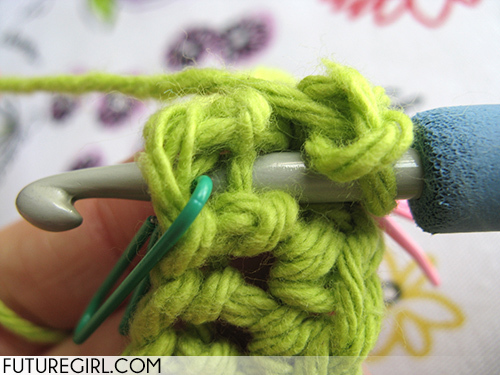 Pull on the yarn end to tighten it up. 70. 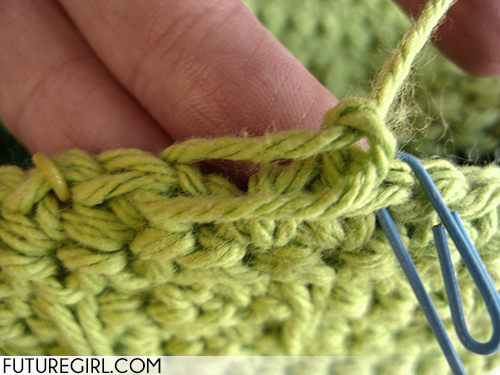 Keep tightening it until it looks like the top of all your other single crochet stitches. 71. 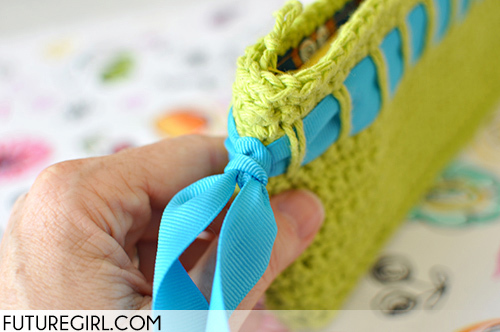 Weave the end under several rows of stitches and then knot the yarn to your wristlet to secure. Your knot will be hidden under the zippered lining. 72. 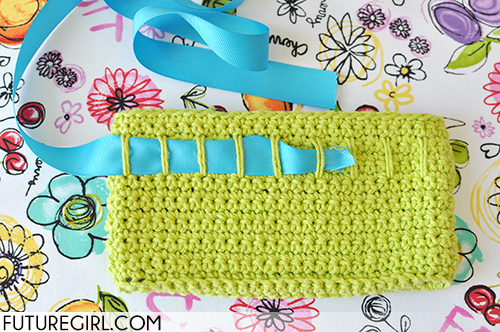 If needed, pull the beginning yarn end into the inside of your wristlet with a crochet hook. Mine are always on the outside. 74. ... and pull it inside. 75. Done! You have finished the crocheting portion of this project. Now it's time to sew the lining.